is resistant to the passage of time. as when we were in full bloom. to any temple or church to worship God. The whole existence is God’s temple. Your own body is the temple of God. Your own heart is the shrine. to any religion to experience God. This is our first snow of the winter. First forecast as rain, then as ‘a dusting,’ the weather forecast is changing yet again. As the storm intensifies and the temperature drops, now we are hearing that we may get a few inches of snow. Nearly an inch has gathered in the grass now; and puddles on the patio, from our early morning rain, have begun to freeze over as snow landing there lingers in the slush. Winter has finally blanketed our garden in penetrating cold. It is the way of things, and a necessary passage of rest and dormancy before the coming of spring. My dad and I attended an opening at a local gallery in mid-December, and were interested in an eclectic collection of bird feeders made from re-purposed glassware. We purchased a few as gifts. And since then it has remained my intent to construct a few myself. A trip last week to the Re-Store, with a good friend, yielded the odd bud vases and hollow ware needed. And so on Friday, I constructed a few glass feeders by gluing the pieces together with a special glue made to hold glass and ceramics. I also made a batch of “Ron’s Suet Cakes” from the recipe the artist sent along to re-fill his glass ‘sculptural’ bird feeders. This easy recipe is laced with Cayenne pepper to keep squirrels, and other rodents, away from the feeders. Here is one of the feeders I constructed on Friday. Like many, we prefer to ‘feed the birds’ naturally through a garden planted with those berry and seed producing trees, shrubs, and perennials they prefer. Knowing that song birds need a diet rich in insects, we expect this rich habitat provides them with an abundance of tasty insects, too. 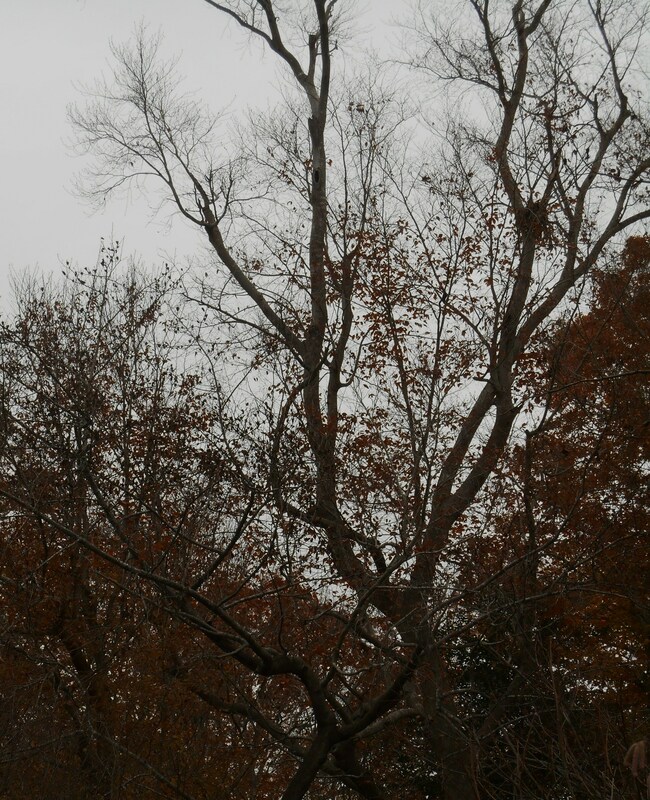 But we also provide additional food to sustain our birds during winter storms. And so this enriched ‘suet cake’ project has proven timely. 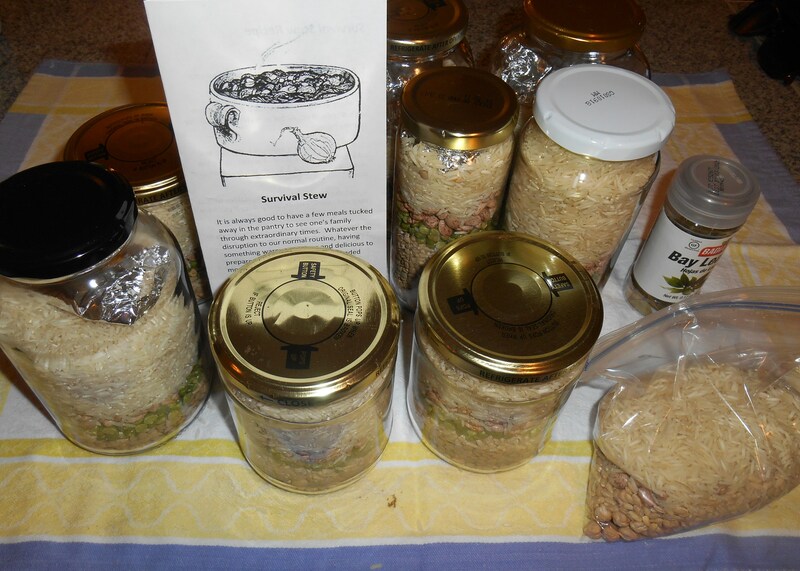 I’ll share Ron’s recipe so you can make a batch of this special winter bird feed yourself, if you are interested. I was pleased with how quickly it set up. After filling the three feeders I made on Friday, there was enough left to fill two small plastic cups to use as ‘re-fills’ for one of the original feeders my parents kept. Thirty seconds in the microwave was enough to let me pour the mix easily from the plastic cup into their glass feeder yesterday. I swished a little fresh birdseed in the plastic cup to clean it thoroughly, then piled that seed on top as an extra offering to their garden birds. This feeder, made on Friday, will be shared with a friend. The vase sits over a dowel or a spike of some sort to hold it steady in the garden. Additional seeds can be added to the saucer. 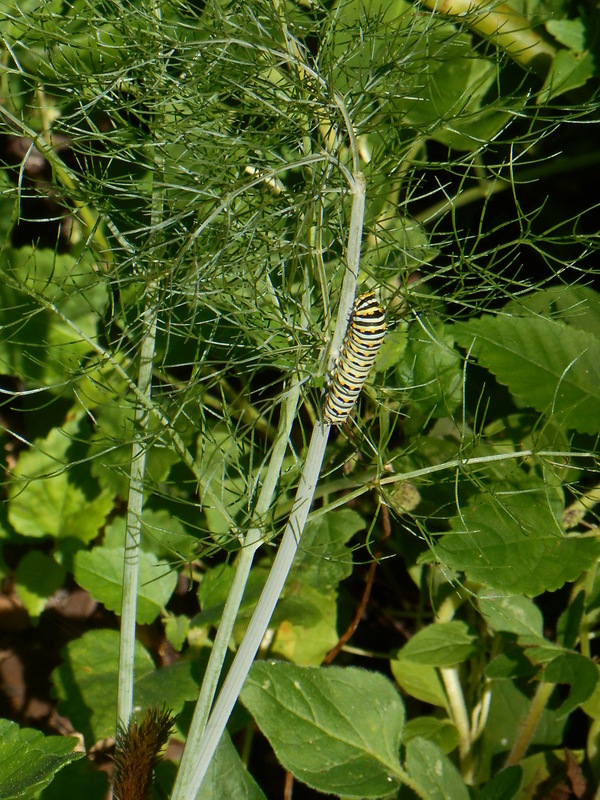 Any ‘extras’ you want to add, such as shelled sunflower seeds, dried insect larvae, Niger seed, etc. 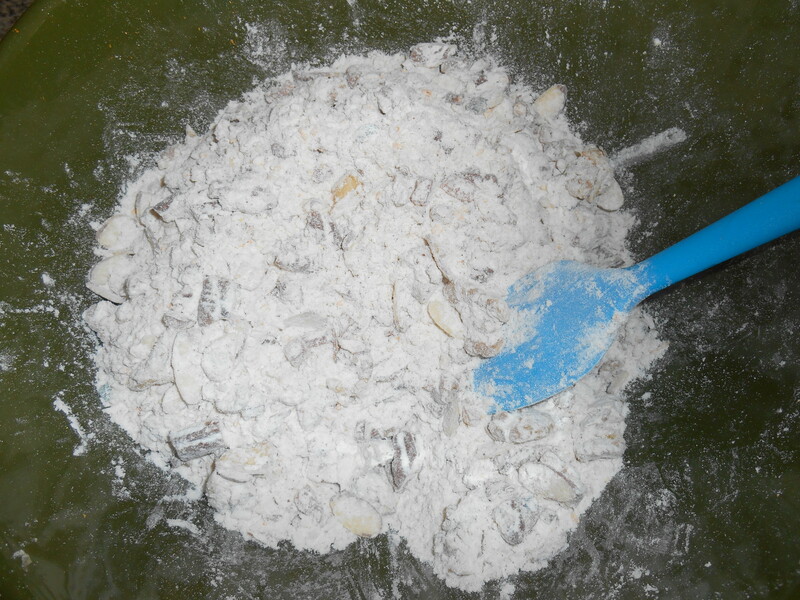 I added about 1/2 cup of shelled sunflower seeds. Melt the lard in a small pan on the stove over a medium heat. Add the pepper as the lard melts so that it is well flavored. Squirrels hate hot pepper and won’t eat seeds treated with Cayenne. Turn off the heat, and add the peanut butter to the melted lard. Stir as the peanut butter melts. Finally, stir in the cornmeal, oats, and seeds. Pour the mixture, before it sets up, into any glass, metal or plastic mold. You can also use this mix to coat pine cones. Attach a wire for hanging to the cone before coating it. I like this recipe for winter feeding because of the fat content, which will help the birds survive the cold weather coming. This is a neat alternative to feeders filled with dry seed, which often gets wet and mouldy after a hard rain. It will also keep rodents away from the feeders, if that is a problem in your garden. 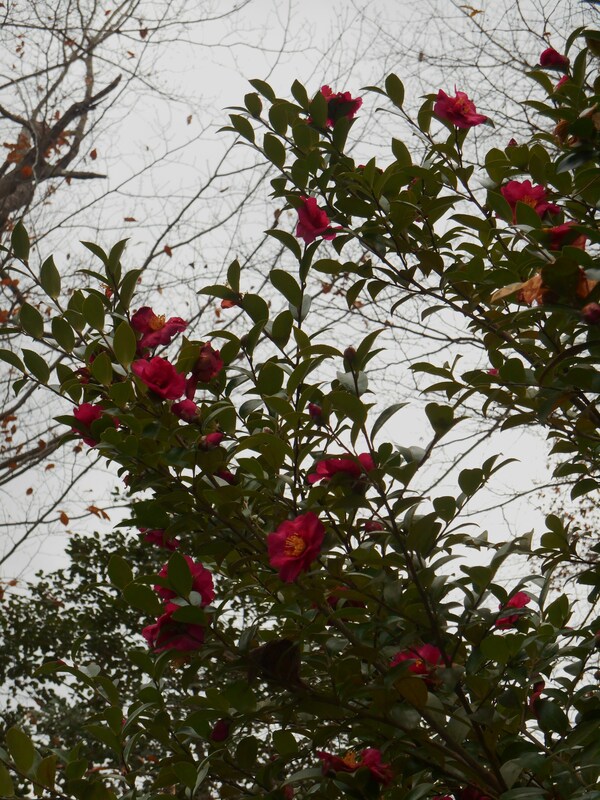 Our first snow of the season came quietly, almost without warning, and has left the garden transformed. So beautiful and cleansing, snow invites us to stop and take notice. We break out of the routine to simply sit and watch it accumulate. A magical winter light fills the garden, bouncing off each icy flake. 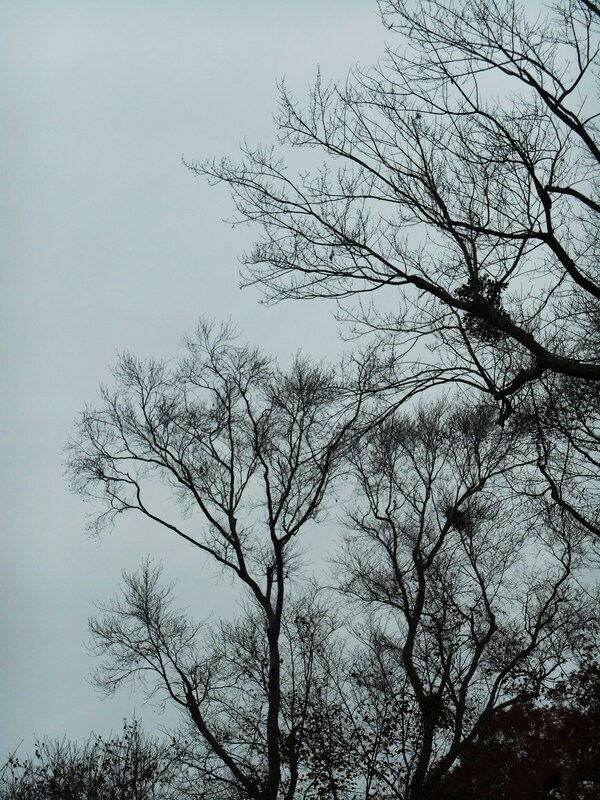 Listening carefully, we can hear it falling, piling up softly but steadily on every leaf and branch. 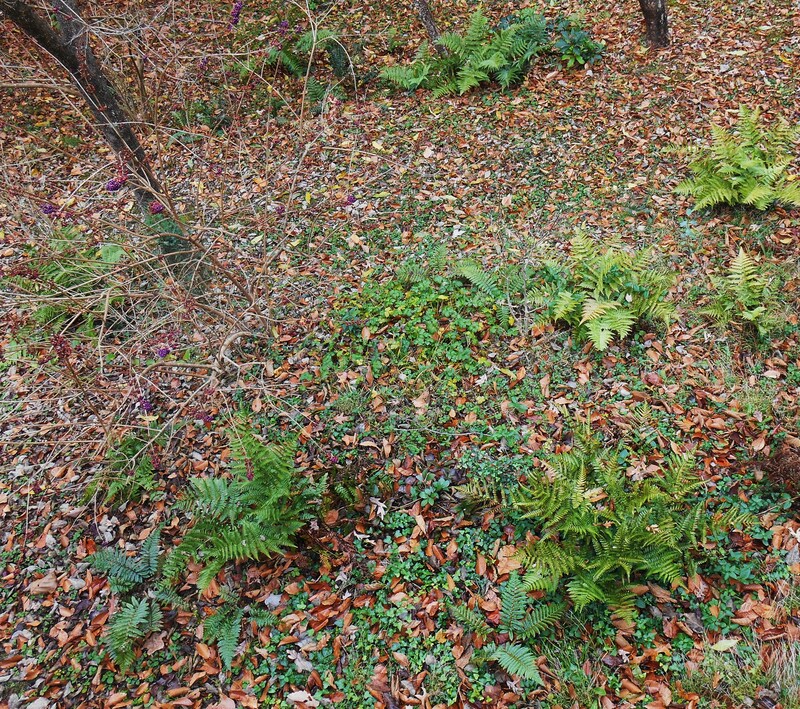 Winter finally has arrived in our Forest Garden. “It is always good to have a few meals tucked away in the pantry to see one’s family through extraordinary times. Whatever the disruption to our normal routine, having something warm, nutritious and delicious to prepare gives comfort when it is needed most. This little jar of ingredients, cooked simply in water, can feed a family of four in about two and a half hours. This mix is a complete vegetable protein, and will give a lot of energy. You could live on this for a long time in an emergency. These are the store brand beans I bought at Martin’s yesterday for about $7.00. I ended up not using the white Great Northern beans in the mix. The rice is from Trader Joe’s. One could probably order all of the ingredients online at a lower price. These are the opening words of a little pamphlet I have written this weekend, after coming across an interesting article on the internet Friday evening. 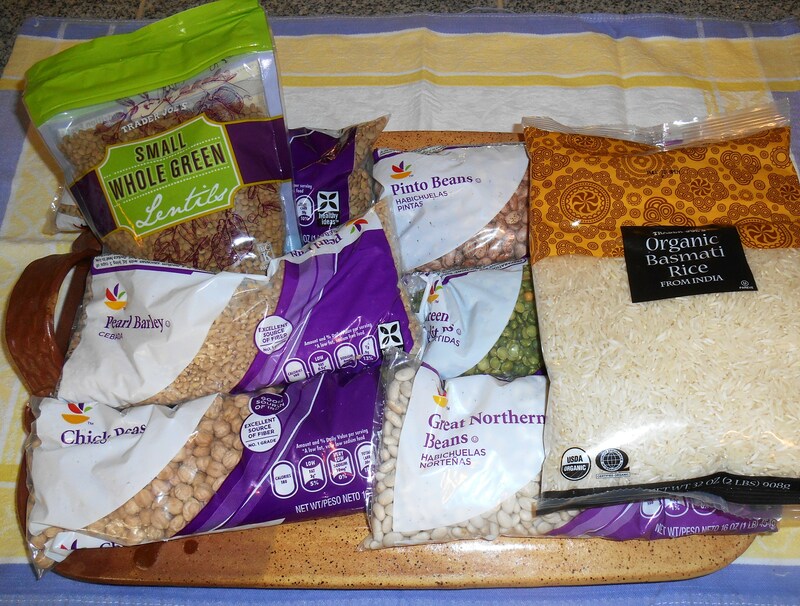 The article described this stew mix as a way to store a year’s supply of food for under $300.00. Do you read those articles, too? And while I couldn’t eat this, or any other stew, for every meal for even a week; it sparked an idea for a simple and inexpensive way to put aside a few meals for any sort of emergency. Having weathered two hurricanes in Virginia, many snow storms, illness and family emergency; I know the value of having a little food laid away and ready to use when needed. And so decided to experiment with the recipe I found online, adapting it for a more practical storage method than five gallon pails lined with Mylar…. You may have read some of the stories popping up on the internet about hard times ahead. There is a lot of anxiety around this September, especially. I’m not expecting any of the numerous scenarios we’ve all read about to unfold, any more than I expected the world to end in late 2012 or modern life to grind to a halt in January of 2000. There is big business these days around creating additional fear in people’s lives. 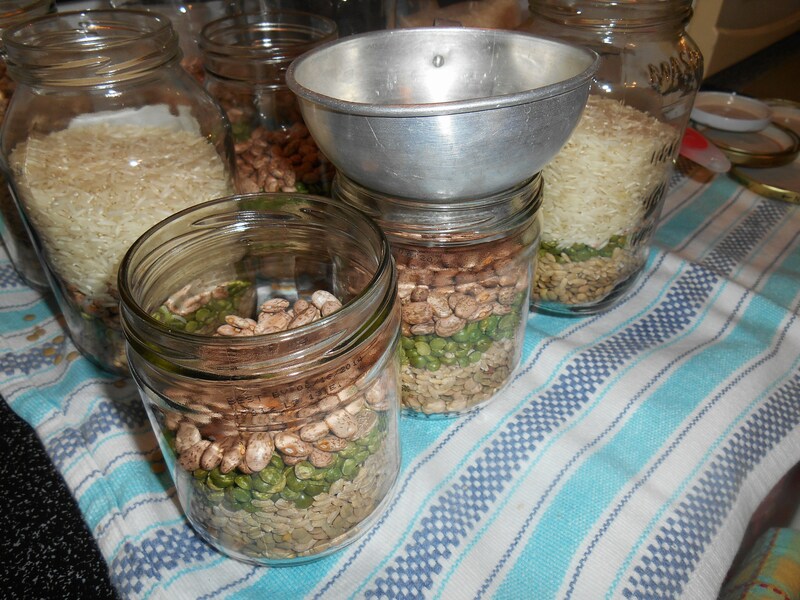 A single bag of each ingredient will make many jars of Survival Stew mix, and costs very little. Why not share a few jars with close friends and family members? Be sure to copy these instructions to accompany your gift of a meal, ready to make when it is most needed. I raided my stash of empty jars looking for enough to assemble the ingredients this afternoon. Some proved a little too big, others a little to small. This isn’t rocket science, and so I made do with what I had and adapted. If I were buying jars for this project, I would buy quart jars even though they’ll be a little too big. Make this stew once or twice to see how you like the mix and what extra ingredients you wish to have on hand. Then tweak the recipe to suit your family and mix up several jars of the dry ingredients to store for when you need them. I learned that filling jars on a clean tea towel made clean up much easier. 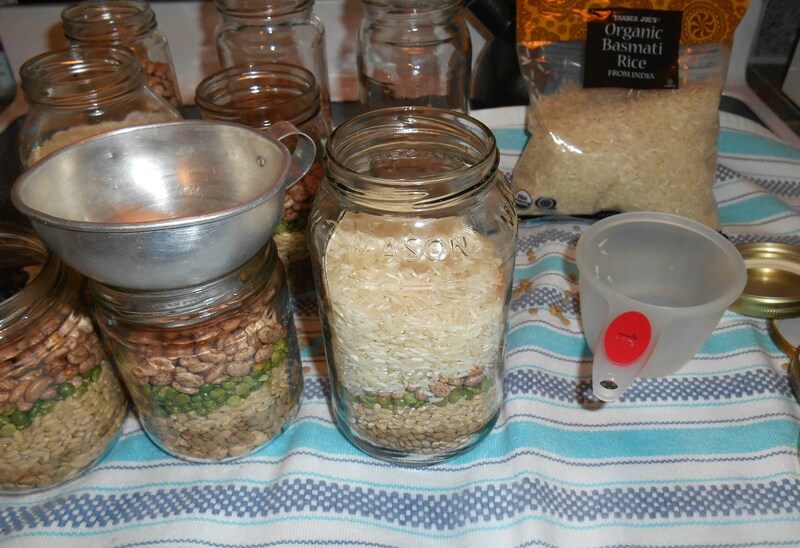 Even using a funnel, the tiny lentils and grains of rice splattered as I poured them from measuring cup to jar. I fudged the recipe and just used 1/4 cup of everything except the rice. 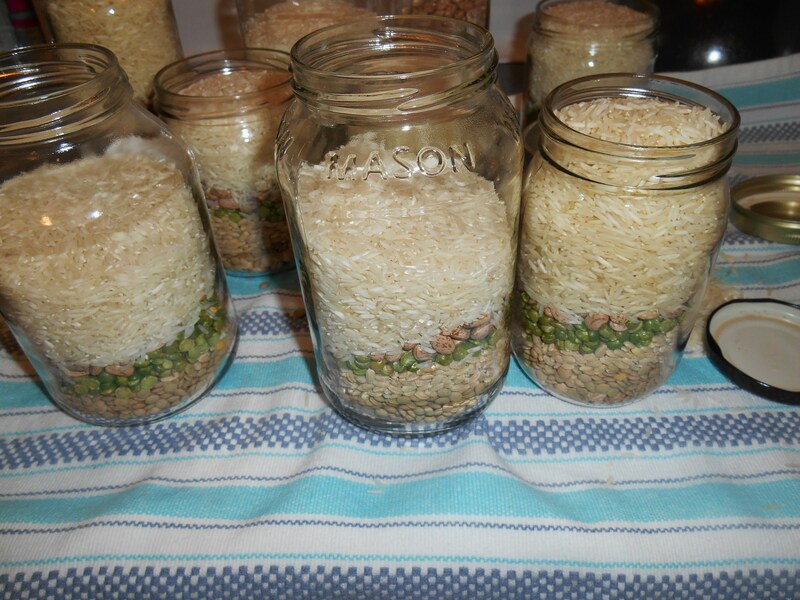 I used about a cup of rice per jar, removing a little if needed to seal the jar. For some of the smaller jars, I shook and rattled the jar to pack it all in. All of the leftovers from the bags and the dropping from the tea towel went into a plastic baggie, which I’ll use for soup making sometime soon. Cut out a 5” square of aluminum foil for each jar you have filled. Place a 5”square of waxed paper on top of each square of foil, and measure the seasonings onto the waxed paper: 1 tsp. 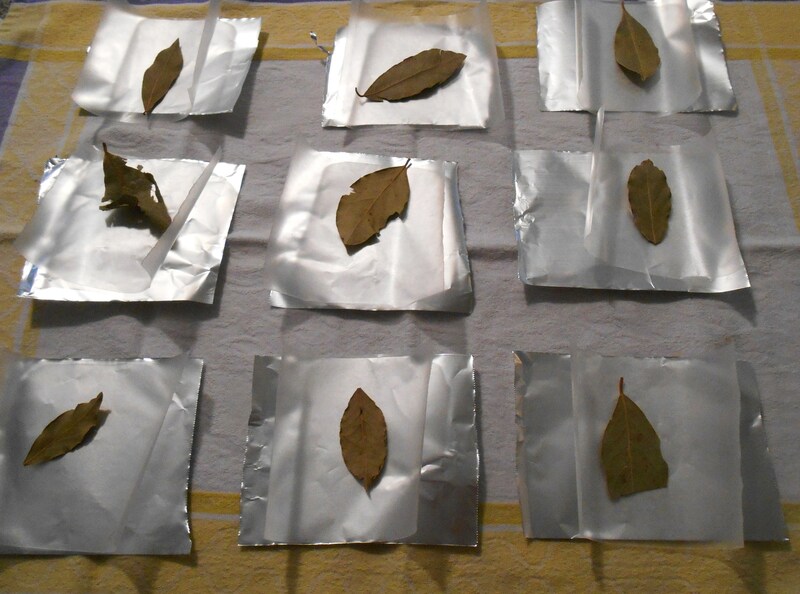 salt, 1 Bay leaf, 1 TB dried minced onion, 1 tsp. granulated garlic, 1 tsp. dried herbs (such as Parsley or Rosemary), ½ tsp. cumin powder and ½ tsp. ground pepper. If you like spicy stew, add 1 tsp. or more of red chili flakes. I cut my papers a little smaller than 5″, and had to give up adding seasonings to the piles before adding the pepper or herbs. The papers I had cut just barely wrapped around the spices. I stuffed them seam side up into the top of each jar before sealing the jar. Rinse the beans and rice in cool, running water until the water runs clear. Place them in a large soup pot and cover with 4” of water. Allow everything to soak for twenty minutes. Put the pot over a medium high heat and add another 6 cups of clean water. Bring the mixture to a boil for 3-5 minutes, and then turn down the heat to simmer. Add the flavor packet and vegetables such as chopped celery, carrots, and potato if you have them. You may also add a can of diced tomatoes or tomato puree after the first hour of cooking. Simmer the soup until all of the beans are tender and the stew has thickened, which will take about two hours. Add vegetable juice or broth if you have it. Adjust the seasonings to taste. Add cooked meat if you wish during the last half hour of cooking. Garnish with yogurt, sour cream, or chopped fresh greens if you have them. Serve with hot cornbread or rolls. It has been months since I’ve simmered a pot of soup on the stove. And I’m not about to make this anytime soon, until we get a real fall day. So please excuse the fact I can’t show you a photo of how it turned out. But I’ve made many bean soups over the years, as you probably have as well. It is a straight forward process, as it should be. A bowl of this will give one energy for whatever the task at hand may be, whether shoveling snow or clearing fallen trees. If this inspires you, please give it a try. The whole project ended up costing a little less than $15.00, including the giant containers of Badia brand herbs and spices I stocked up on today. 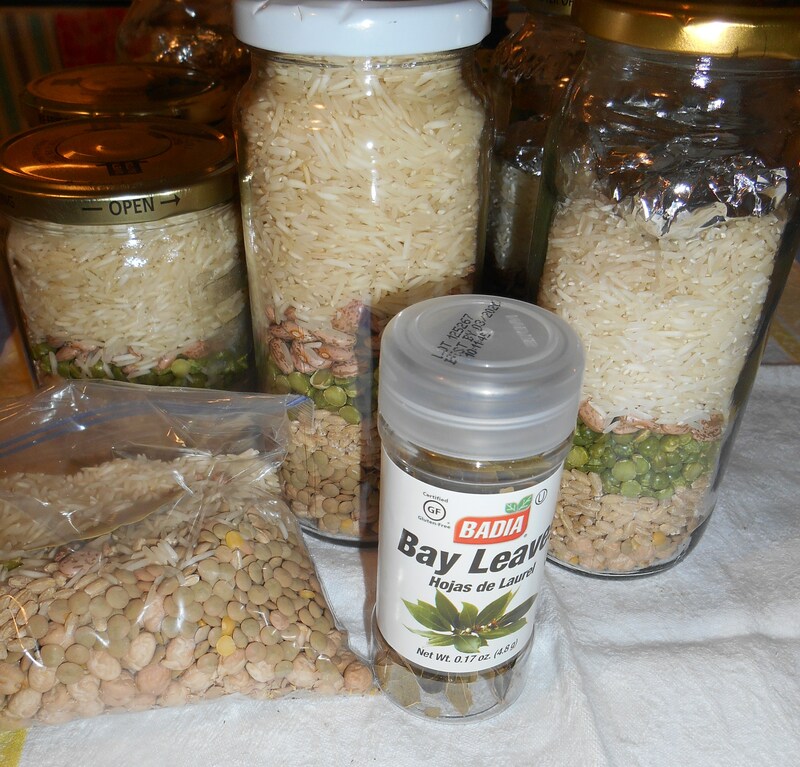 Most came from the pantry, but I bought fresh Bay leaves, Parsley and fresh Cumin. Those are most likely to loose their pungency as they get older. I counted the price of the organic Trader Joe’s rice already on hand, too. That investment will yield nine full pots of stew. Each pot would feed us for several meals. That is a pretty thrifty investment in good quality nutrition any way you calculate it. But this “Survival Stew” could get a little boring if you were eating not much else. I’ve come up with a list of “add-ins” you might want to add to yours. All of these things can be stored fairly easily, and keep for a long time. If you would like a copy of the “Survival Stew” brochure, please ask for it and leave your email in the comments. Note: The original version of this recipe called for red kidney beans. Undercooked red kidney beans can cause nausea and vomiting. Red Kidney Bean Poisoning is an illness caused by a toxic agent, Phytohaemagglutnin (Kidney Bean Lectin). While some other beans also contain this substance, it is strongest in red kidney beans. Proper cooking eliminates most of the bean Lectin, but kidney beans can still cause stomach upset. Never eat undercooked beans, or beans which have been soaked but not boiled. Do you love chocolate? For some of us, chocolate is a passion. And our friend, who celebrated her birthday with us this week, loves chocolate more than most. I wanted to make for her the ultimate chocolate birthday cake. I grew up with a dad who remains passionate about chocolate. 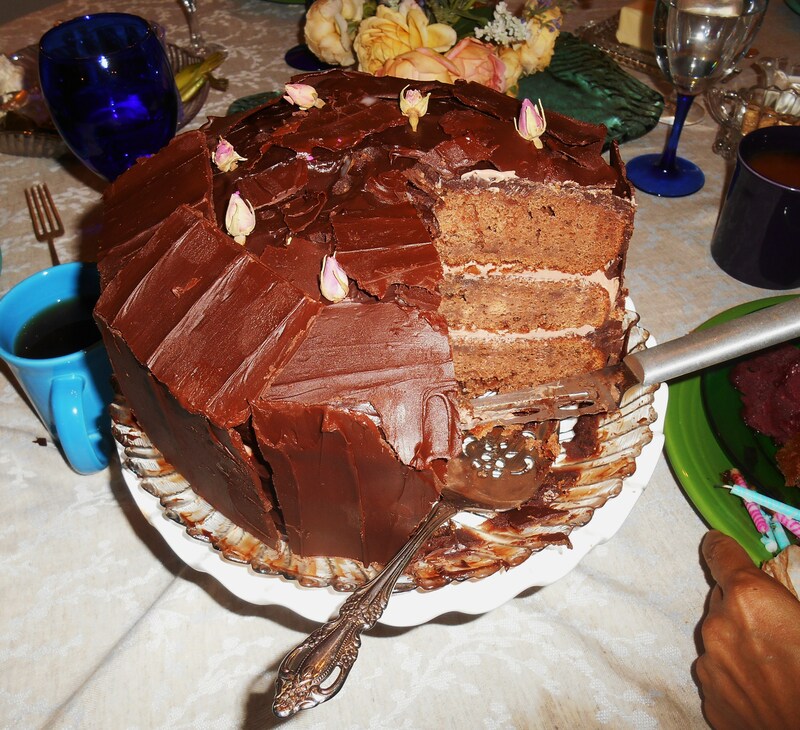 One of the first recipes I ever learned to make was chocolate mocha frosting, to make his favorite cake for him. And so that is how I gave up on gardening for a few days this week to spend time cooking instead. 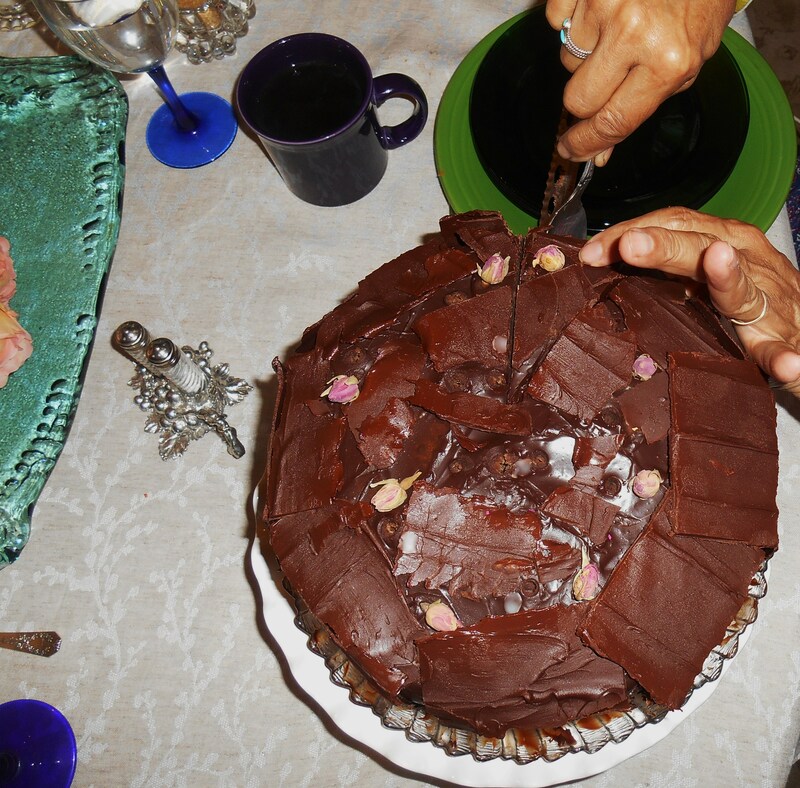 Our friend cut generously huge slices of her cake to share with us all. 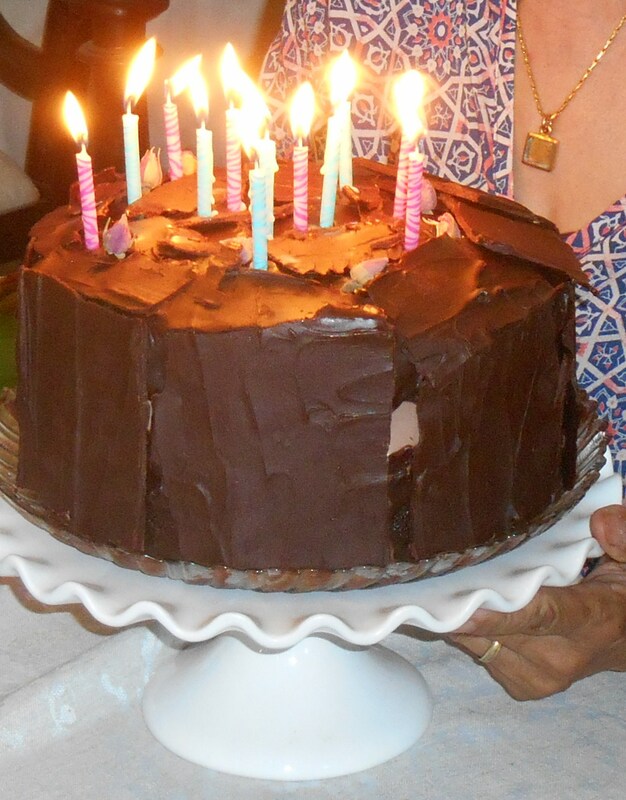 The cake was a two day love affair with chocolate. It is a chocolate blackberry jam cake, filled with blackberry chocolate cream cheese frosting and covered in dark chocolate ganache. Have you ever tried chocolate blackberry jam cake? It is rich and satisfying, like a wonderful jam filled chocolate bar. It is an old fashioned cake, made with six eggs, molasses, butter, and lots of cocoa and jam. The aroma of blackberries permeates the entire house as it bakes. And then the following day, we smell the chocolate melting into the buttery cream as the ganache blends, and is then poured in thick dark curtains of chocolate over the top and sides of the cake. Sheets of chocolate cinnamon candy, wrapped around the sides and top of the cake, encase it all. We had a great time eating huge slabs of this special cake together, and our friends generously left a bit behind for me to share with my father. I think there was enough chocolate to satisfy us all, and we all happily celebrated our special friend on her special day. Barbara, at Silver in the Barn, invited me to join the Five Photos Five Stories Challenge, and this is my fifth and final post in the series. This is a simple challenge: To participate, you simply post a photo each day for five consecutive days, and tell a story about each photo. The story can be truth or fiction, poetry or prose. Each day one must also nominate a fellow blogger to participate in the challenge. Today I would like to nominate Robin, at Breezes at Dawn to play along with us. Robin and I share a love for wildlife, gardening, and sunsets. Her photos are some of the most exquisite and loving photos I’ve seen anytime from anyone. I hope Robin will agree to accept the challenge, and that you will visit her, if have not followed her already. Robin tells wonderfully insightful anecdotes about life on Maryland’s Eastern Shore, between the Chesapeake Bay and the Atlantic Ocean. Thank you for visiting today to eat the cake with your eyes, and my apologies for not offering you an extra fork. I hope you will join your happy birthday wishes with ours for our special friend. 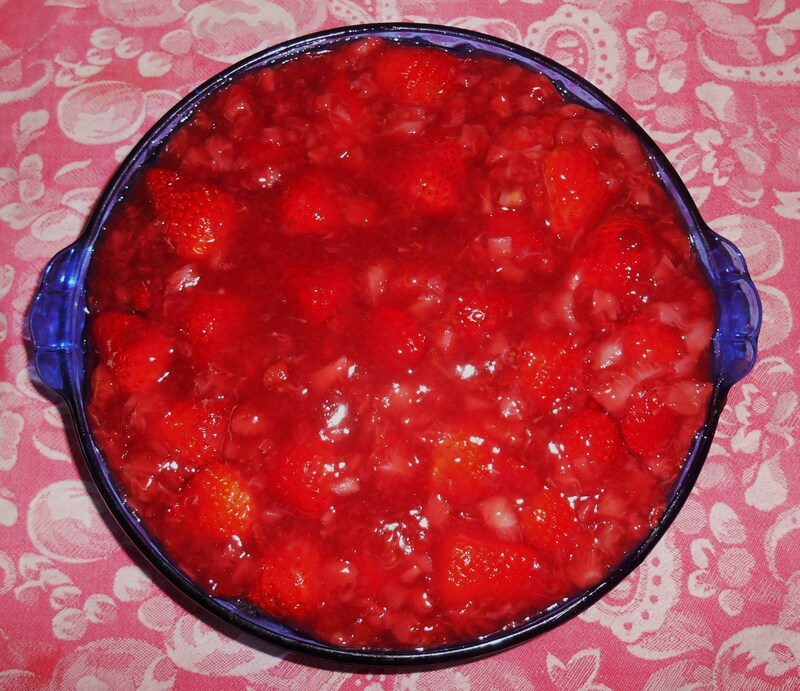 One Word Photo Challenge: Strawberry Pie! 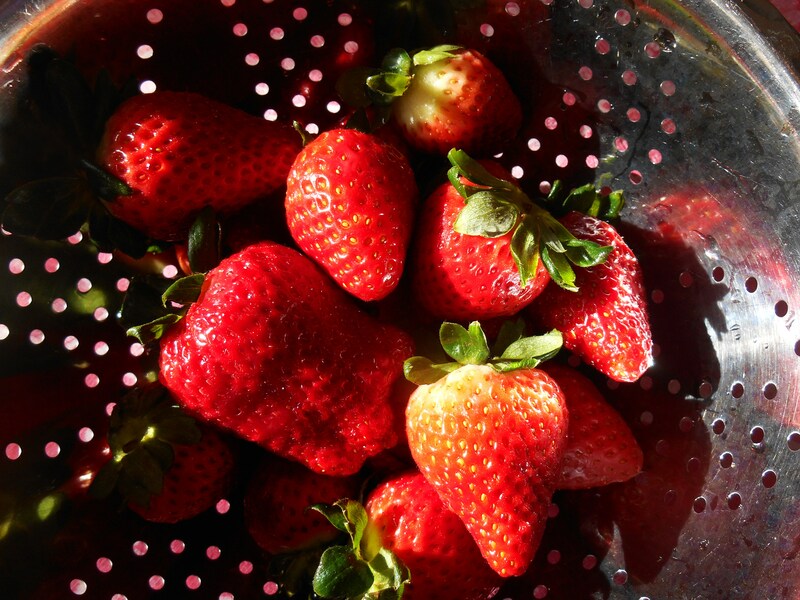 What tastes more like spring than strawberries? We love strawberries sliced and drizzled with a bit of honey almost as much as we love them whole and warm, freshly picked and fragrant. 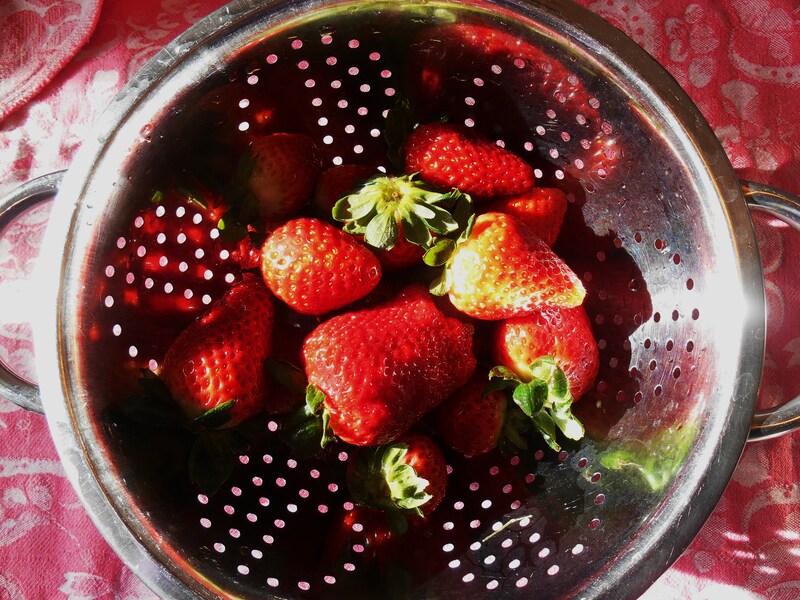 Coastal Virginia is known for our abundant harvest of sweet strawberries, but the harvest is still months away. Our produce guy hinted these may have come from “south of the border.” No matter. We are thrilled to have them! We will enjoy them this evening on top of chocolate coconut pie. The filling is made from a pudding recipe I found several weeks ago in Vegetarian Times magazine. Yes, I’ve tweaked it a little bit…. but it is still vegan and gluten free, if that is important to you. We often eat this as a pudding, but tonight it is made into a pie. Here are the “step by steps” should you want to try it for yourself. Preheat an oven to 350 F. Melt 6 TB of butter or margarine in a pie pan with a handful of thinly sliced almonds, about five minutes. Meanwhile, mix together a cup of almond flour, 1/2 c. of wheat or rice flour, a little salt and 2 TB of sugar (coconut sugar here). Stir into the melted butter with 1/2 tsp. of almond extract, and press into the pie pan to form a shallow crust. Bake at 350 for about 8 minutes or until fragrant and lightly browned. Combine 2/3 C. of powdered icing sugar, 4 heaping TB of cornstarch, 1 C. of unsweetened coconut, and a little salt in a dry pan. Combine well until no clumps of cornstarch are left. Slowly add 3 cups of coconut milk, stirring to dissolve all of the cornstarch and sugar in the first cup. Add 1 cup of water, and stir over medium heat. Allow the mixture to heat gradually, stirring from time to time as the mixture thickens. Take care that a layer is never allowed to form on the bottom of the pan. Stir constantly as the mixture approaches boiling, letting it bubble gently for only a minute or two before removing it from the heat. Stir in 1 tsp. of vanilla extract. Now this coconut pudding is delicious just as it is. Use it at this stage if you prefer vanilla or coconut pudding. But we go a step further…. Cover the pudding filled crust and chill for an hour. 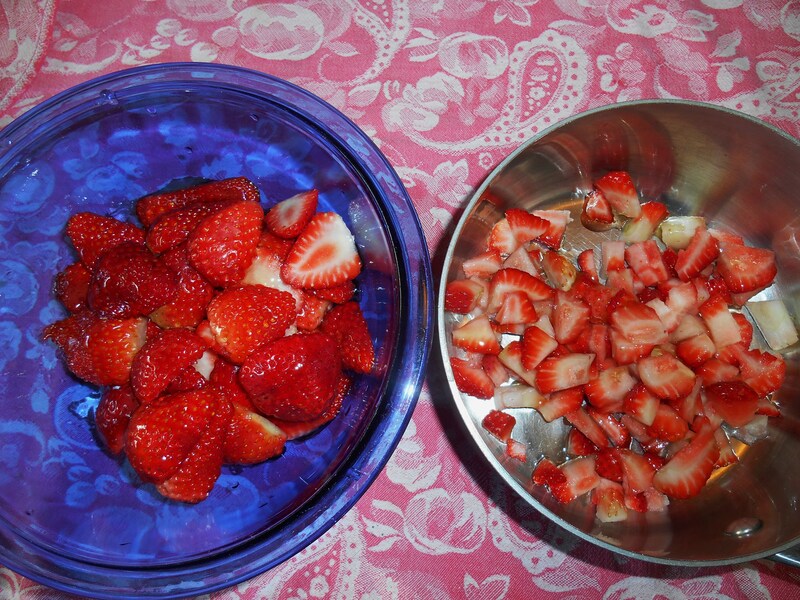 Wash a quart of fresh strawberries, cap, and slice. I cut the two best looking sides off for layering, and dice the middle of the berry into the pan for sauce. 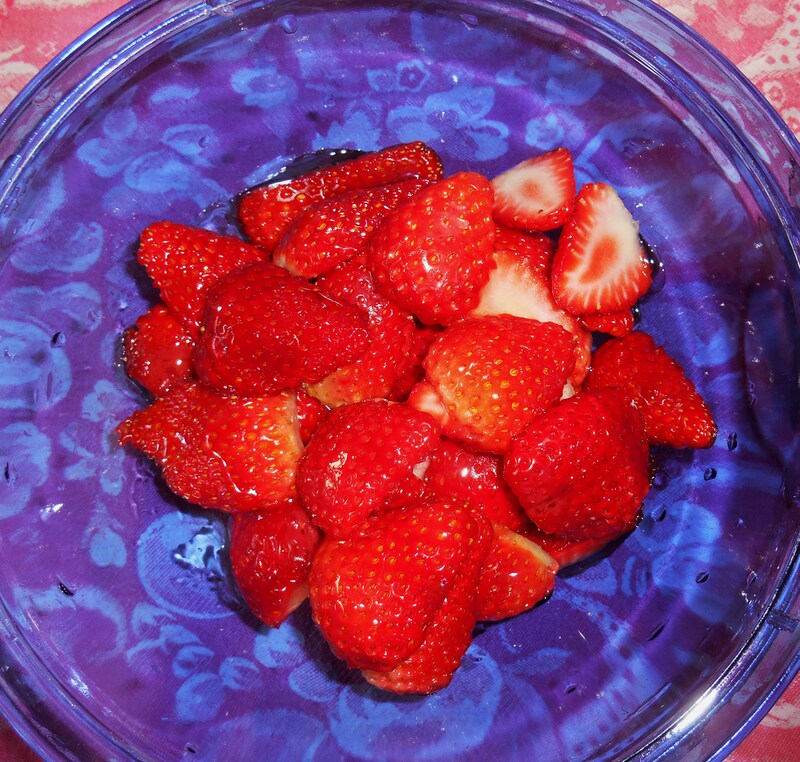 Drizzle honey over the sliced berries and allow them to sit for at least 30 minutes. 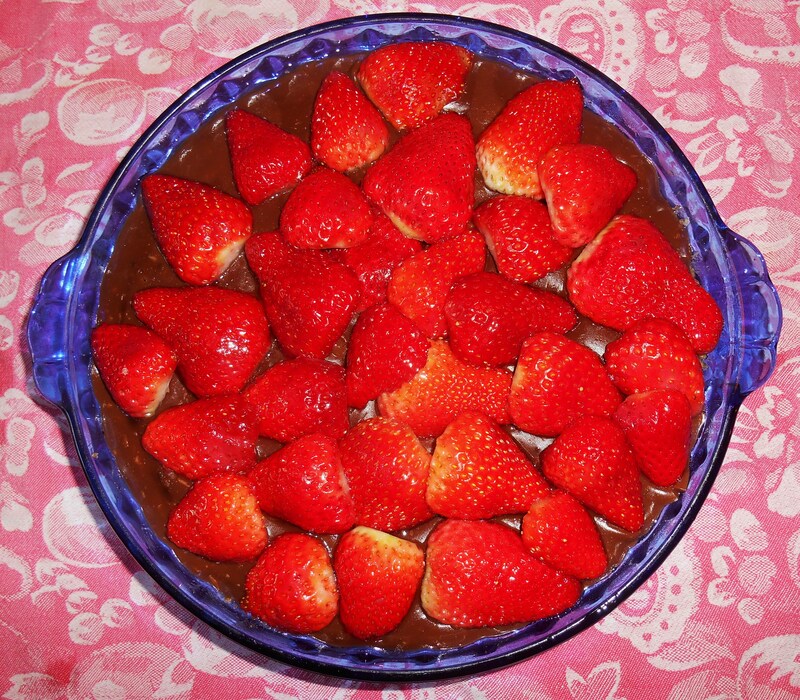 Layer the sliced berries over the chilled chocolate pie, and top, if you wish, with the strawberry sauce. Chill for at least an hour. Garnish with whipped cream and additional chocolate curls just before serving. I’ve gotten a head start on a “new” year. Here is the first loaf of sourdough bread, baked from a newly made starter, in a brand new Dutch oven given to me for Christmas. The entire house is perfumed by this wonderful bread. I’ve been reading two new books about baking bread this week. Both of these speak of time as an essential ingredient to baking good bread. They introduce some new techniques and ways of making dough I have only just begun to learn. I love beginning a new year with learning something new! 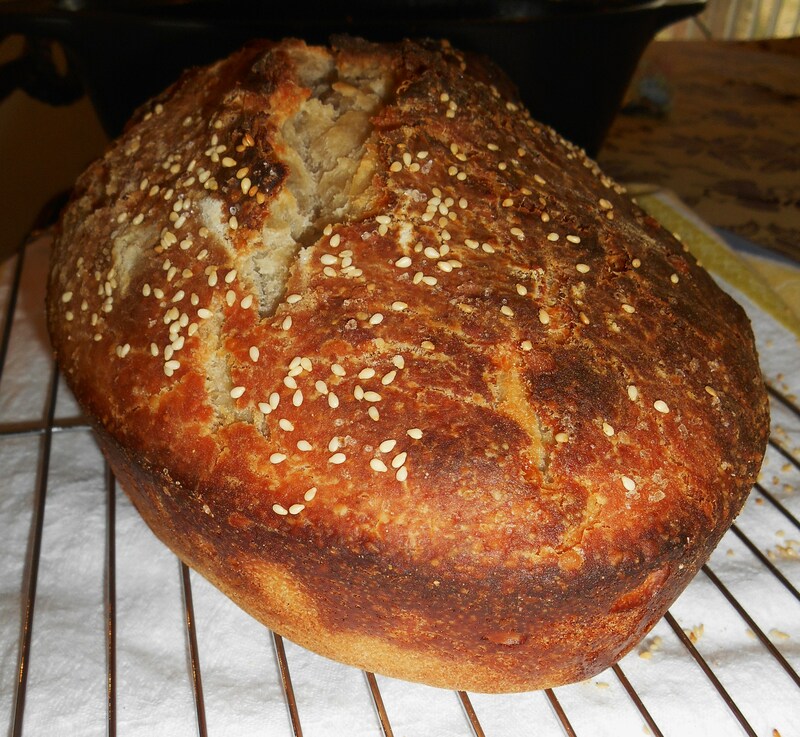 The bread I’ve baked today began a week ago when I mixed some rye flour (a gift from a friend who chose to shift to a gluten free diet) with some bottled spring water, and set it aside to come alive. After two days, I began feeding my new culture with bread flour and more bottled spring water. On the third day I divided my culture in half, giving half to another baking friend, and continued to feed the culture with flour and water. 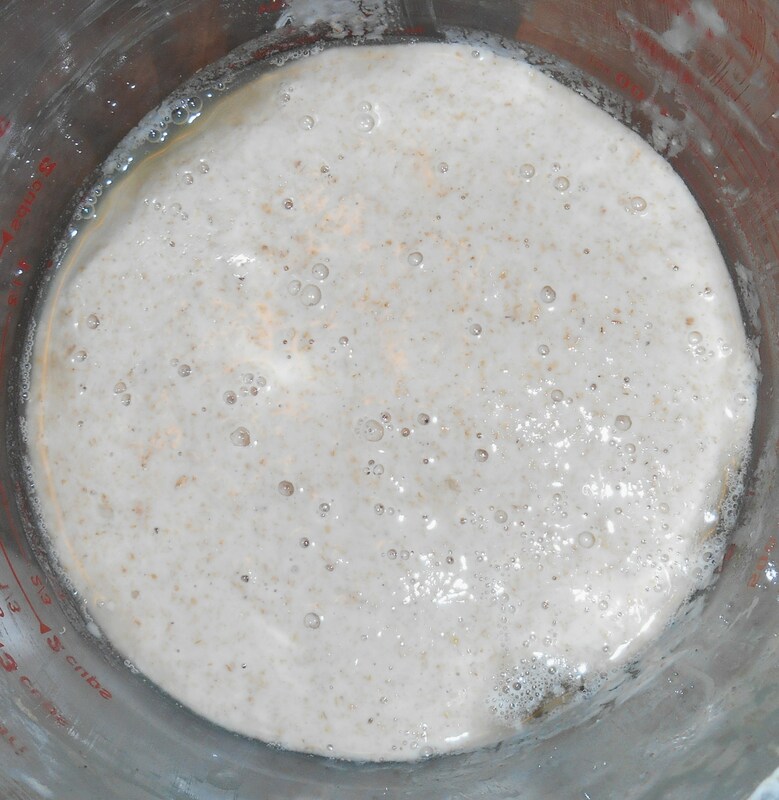 By Friday the culture was ready to leaven a batch of bread dough. When I divided the culture to feed it, half went into the bowl to serve as the basis for bread. I also finally purchased Ken Forkish’s Flour Water Salt Yeast, and set about reading beyond the “sample” to dig into his techniques and recipes. 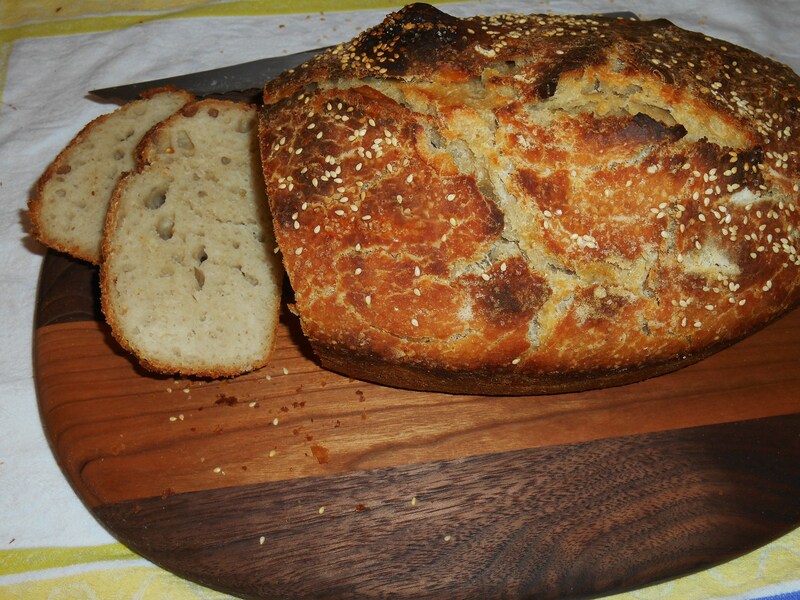 I didn’t follow his recipes for this bread, but I followed many of his principles. I made a well hydrated, loose, dough; “folded” it several times during the rise, and allowed it plenty of time to rise slowly. Translated: The dough was much softer and wetter than I normally make it. I let it rise for about four hours on the counter, and then put the dough into the refrigerator, in a covered bowl, for an additional 36 hours before forming the loaf early this morning. Once formed, with plenty of extra flour used in making the loaf, I let it rise an additional four hours before beginning to bake the bread. 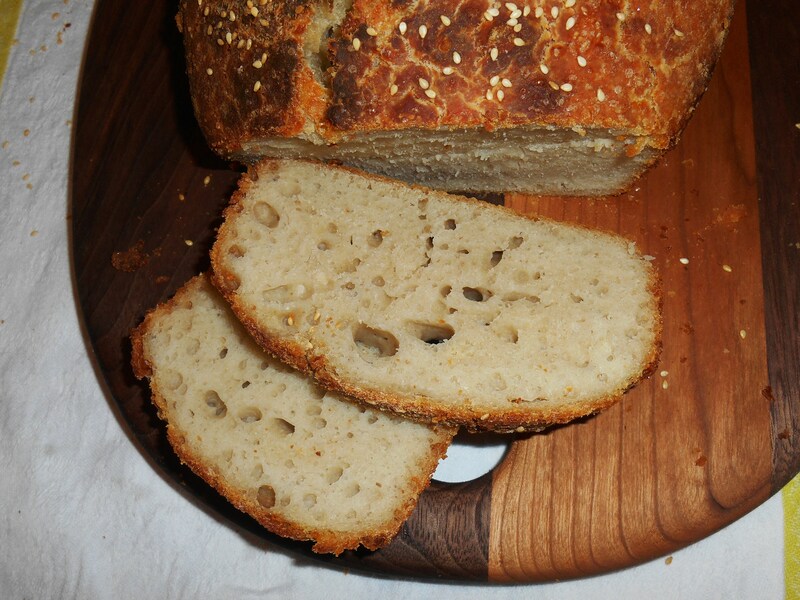 This bread is leavened only with the “sourdough” levain. There is no additional yeast. And the ingredients list includes only flour, water, honey, olive oil, and salt in addition to flour and the levain starter. 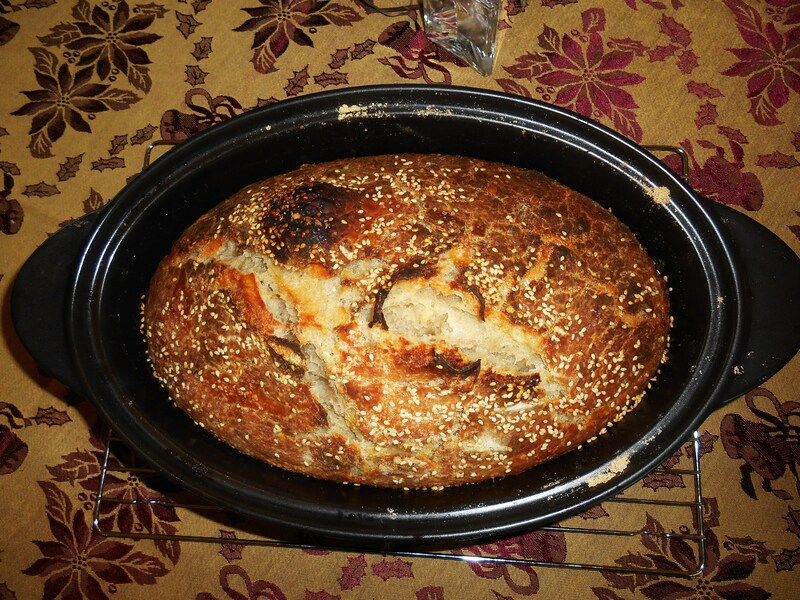 I brushed the loaf with melted butter and sprinkled sesame seeds and sea salt on the top crust before baking. Bread board by Michael Laico. It is the soul of simplicity: bread made as our grandmothers made it in the centuries before we could purchase yeast at the grocery store! What was old is new again…. Our favorite Christmas cake is this rich, moist confection made with fresh and dried fruits, citrus and lots of nuts. My mother calls this a “Dundee Cake,” and we learned to enjoy it while living for a while in Scotland. Friends were coming to join us for afternoon tea yesterday. That was reason enough to make the first batch of the season. My mother’s delicious pound cake recipe serves as the foundation. Pound cake was the first cake she taught me once I finally graduated from the Bette Crocker school of boxed cake mixes so many years ago now. Good pound cake is one of those wonderful traditions handed down generation to generation in some families; and I’m so glad my mother passed this legacy on to me. 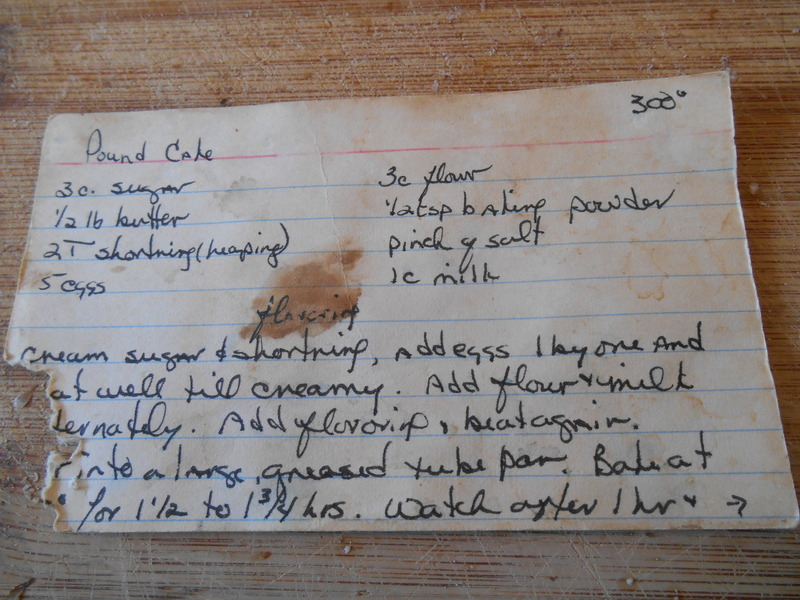 Here is the recipe card I copied from her file more than thirty years ago now. It gives you the basics, but the fine points come only with initiation in the kitchen at the hands of a master baker, like my mother. You may think I’m exaggerating a little here; but those also initiated into the secrets of making pound cake will understand. Now, it is simple enough to throw a handful or two of currants and a cup of chopped almonds into this basic batter and call it done. Dundee cake, a Scottish favorite, is traditionally made with almonds, currants, and sultanas. And it is traditionally decorated with sliced almonds on top. But this is a “riff” on the traditional recipe. My mother has made this “blonde” fruitcake from time to time over the years, in addition to her dark applesauce fruitcake. Since this is my favorite, I add a bit here and there to make it special for my friends and loved ones. If you decide to make it for yourself, leave yourself enough time to relax and enjoy the process. This is a long prep with many steps. And you can take the basic outlines of this recipe and add a bit more of what you like, and leave out those things you don’t enjoy. Candied fruit remains controversial in my family. To Mother, it is required in all fruitcakes which bear that name. My generation is not as fond of it, and some refuse to eat it at all. So the cake will turn out fine without any candied fruit. I’ve listed it here, but leave it out if you want. Begin by setting out three sticks of butter to soften and five eggs to warm to room temperature. Preheat the oven to 300F, and pour a cup of good spiced rum into a medium sized bowl to marinate the dried fruit. I let the fruit soak while doing the rest of the prep, stirring it into the batter as the last step before filling the cake pans. 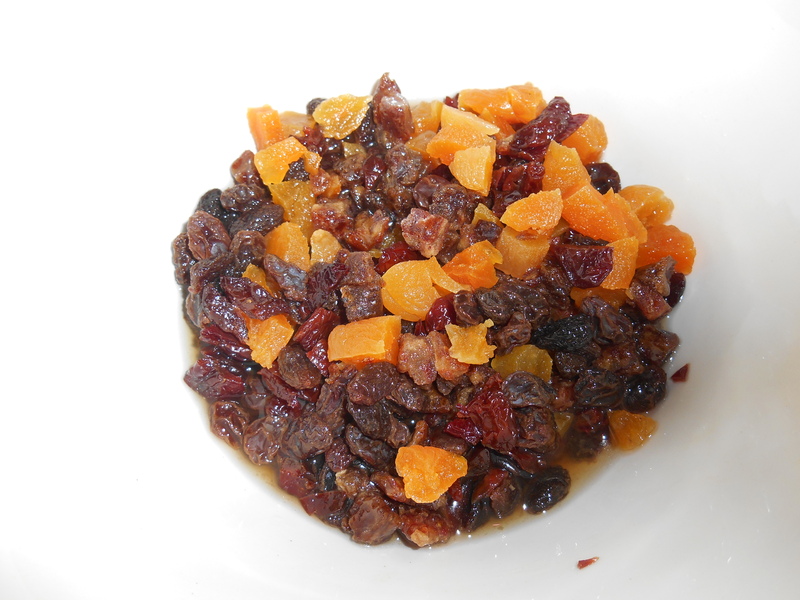 I soak about 2 cups total of fruit to include: raisins (light and or dark), chopped dates, chopped dried apricots, and chopped dried cherries. 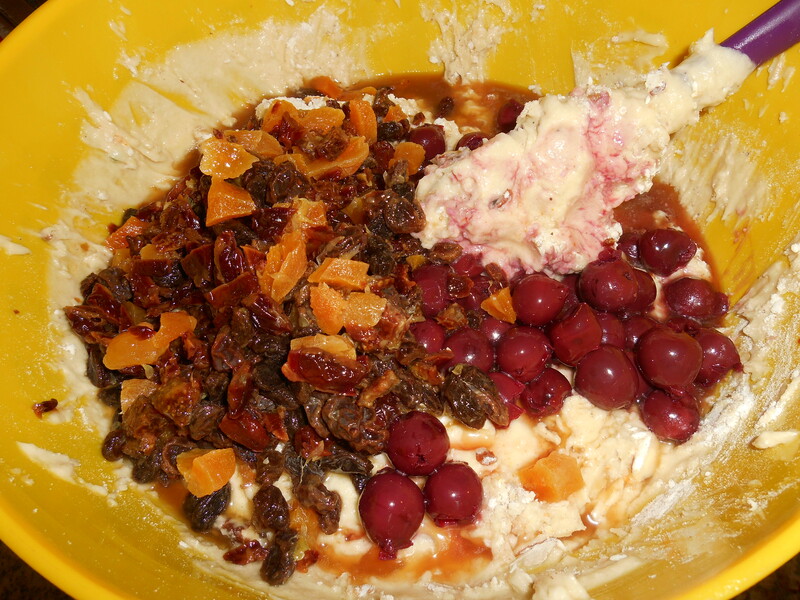 I often add dried cranberries in place of the raisins. Measure 2 1/2 cups of all purpose or cake flour into a very large bowl. All of the nuts, spices, zest, and the candied fruit will get tossed in this flour to coat. 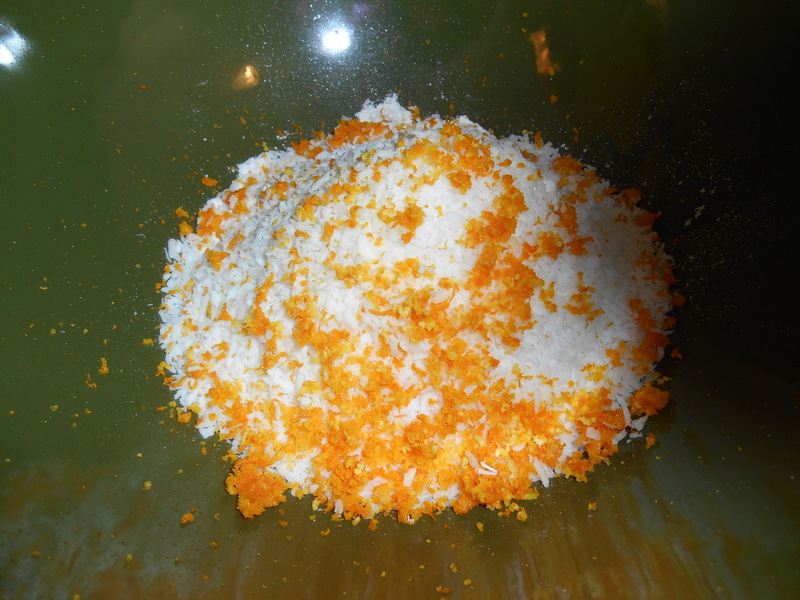 Zest an orange directly into the flour, and add a cup of dried coconut flakes. 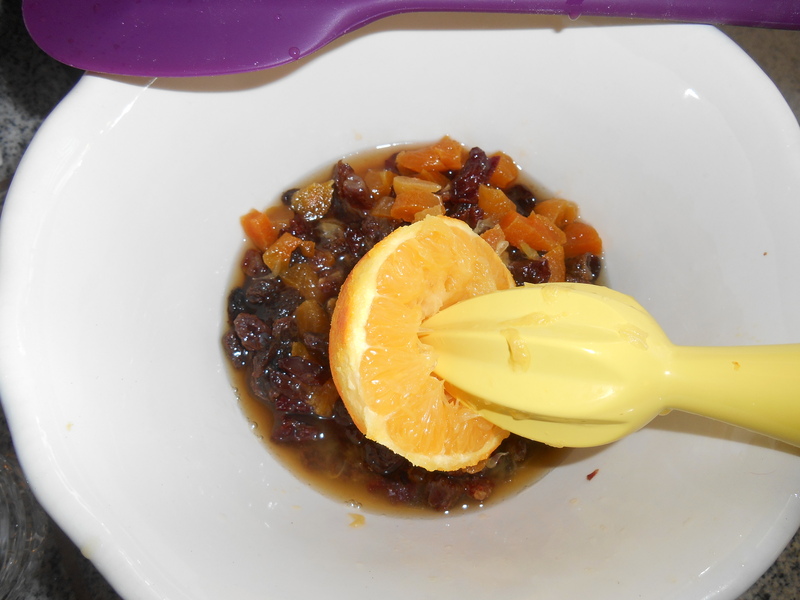 Juice the orange into the rum and dried fruit bowl. 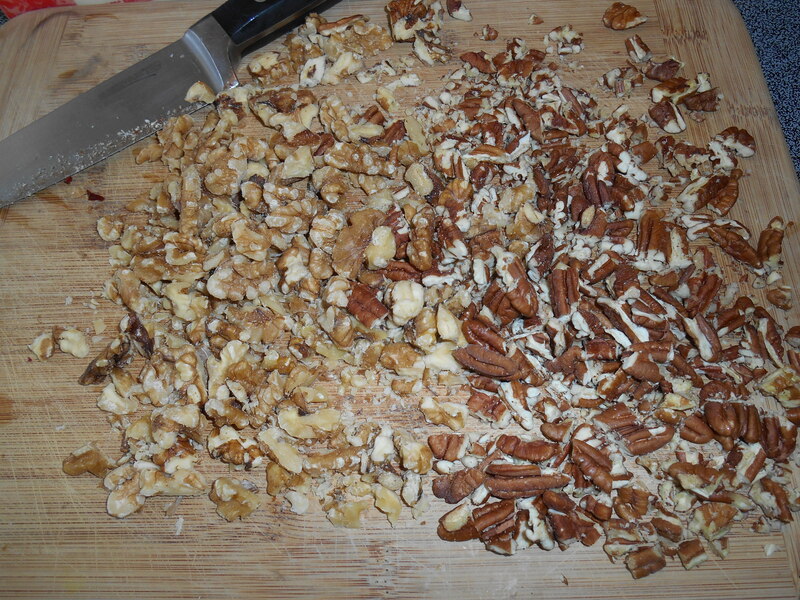 Spread three cups of nuts (pecans, hazelnuts, slivered almonds and walnuts… whatever you have) on a pan and let them toast for about five minutes in the pre-heating oven, while you do other things. When they are fragrant, chop them coarsely and add them to the flour. Other dry ingredients for this bowl include 1/2 tsp. of baking soda, salt, 1/2 tsp. 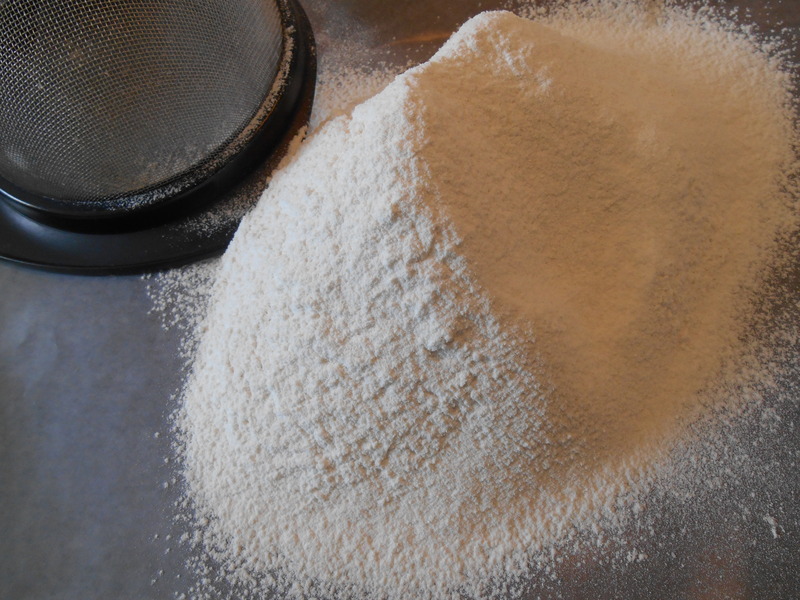 of cardamon powder, 1 tsp. nutmeg, and 1 tsp. ginger. 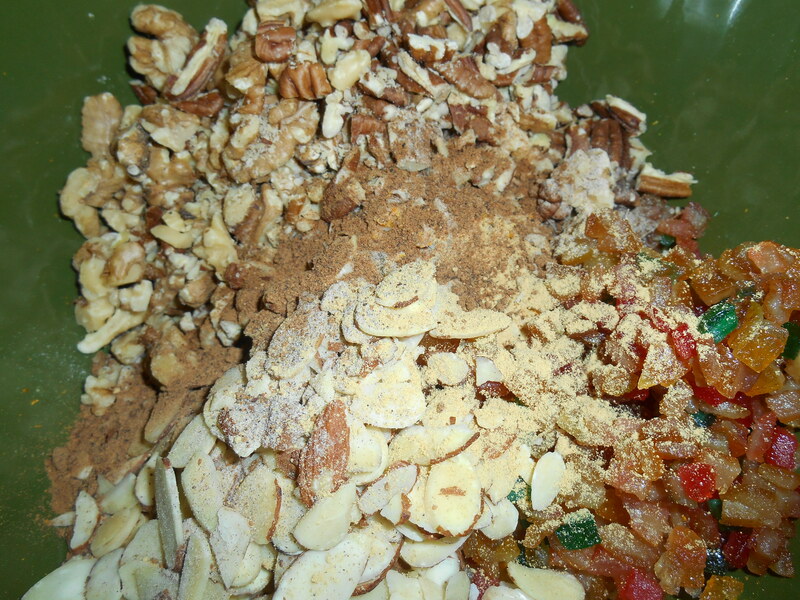 Mix everything well to coat all of the fruit and nuts. This helps keep them well distributed in the final batter and prevents clumping. Measure a cup of milk, and add 1 tsp. of vanilla and 1 tsp. of almond flavoring. Sift three cups of flour onto a sheet of waxed paper. 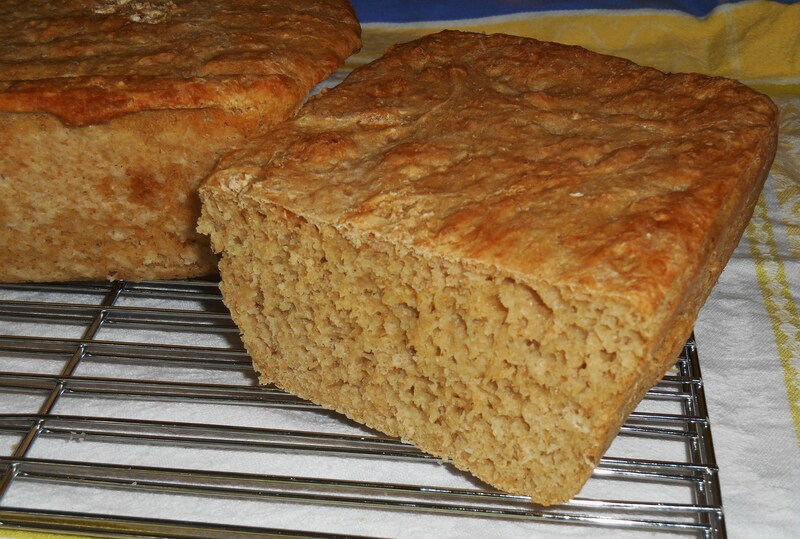 Prepare three loaf pans or one tube pan and one loaf pan by spraying them well with a non-stick cooking spray. I also line loaf pans with waxed paper and sift a little flour into fluted bundt pans to prevent the cake from sticking. With all ingredients and the pans prepped, the cake comes together fairly easily. 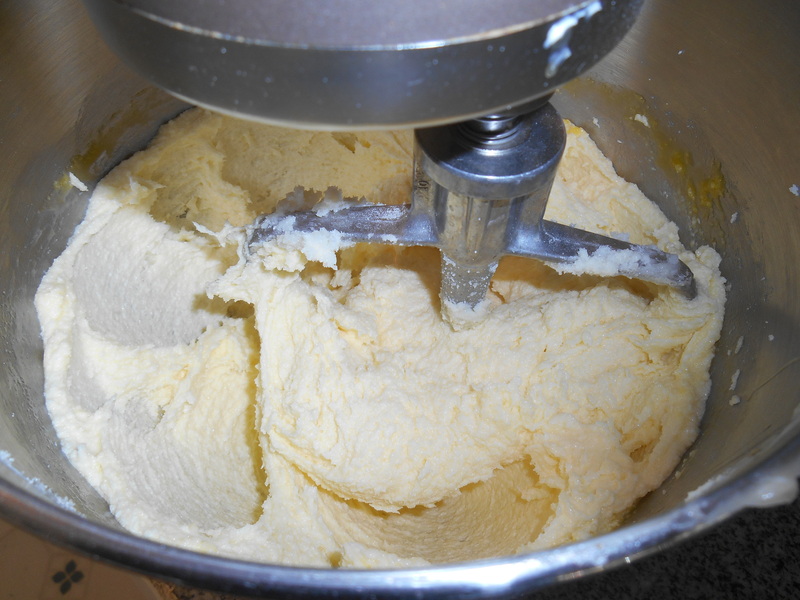 Place two whole sticks of butter, and three TB of the third stick in a mixing bowl and beat on medium speed. Slowly add three cups of granulated sugar and beat until the sugar is dissolved. Stop and scrape down the bowl and beater to recombine all ingredients. 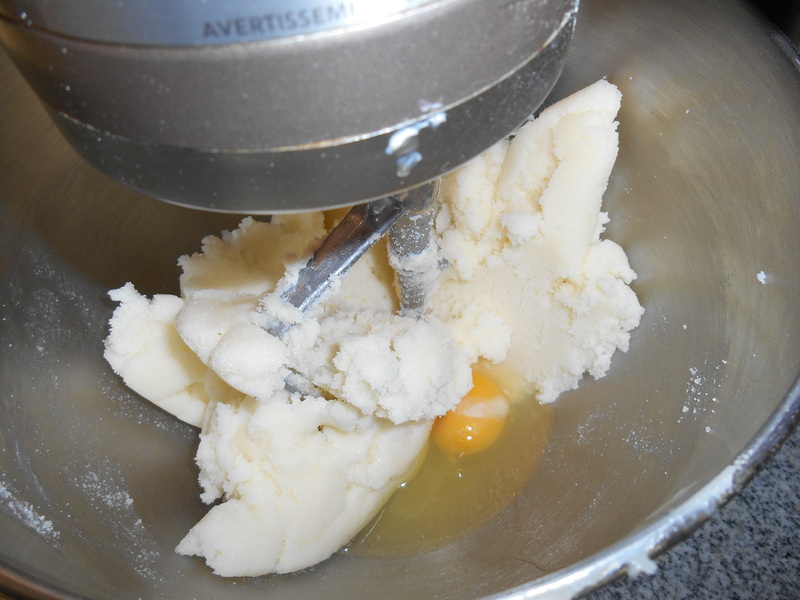 With the mixer running on medium, add five eggs, one at a time, beating well after each egg. Scrape the bowl and beater to combine all ingredients. Beat again on a fairly high speed until the mixture lightens in color and looks very fluffy. Add one c. of sifted flour and 1/3 c. of milk to the mixing bowl, and beat on low. Add the remaining flour, a single cup at a time, with a chaser of 1/3 c. milk after each addition. 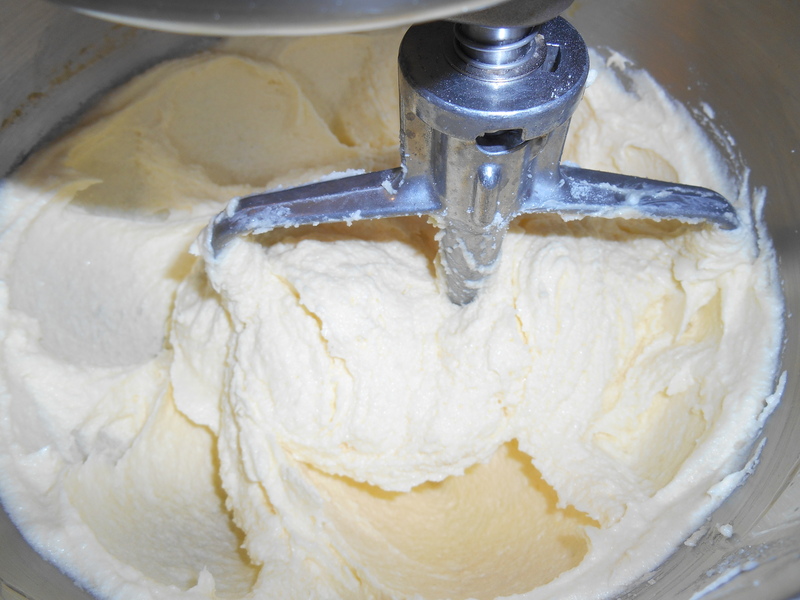 Stop the mixer when the last addition of milk is worked into the batter. Scrape the beater carefully and again scrape down the sides of the bowl. 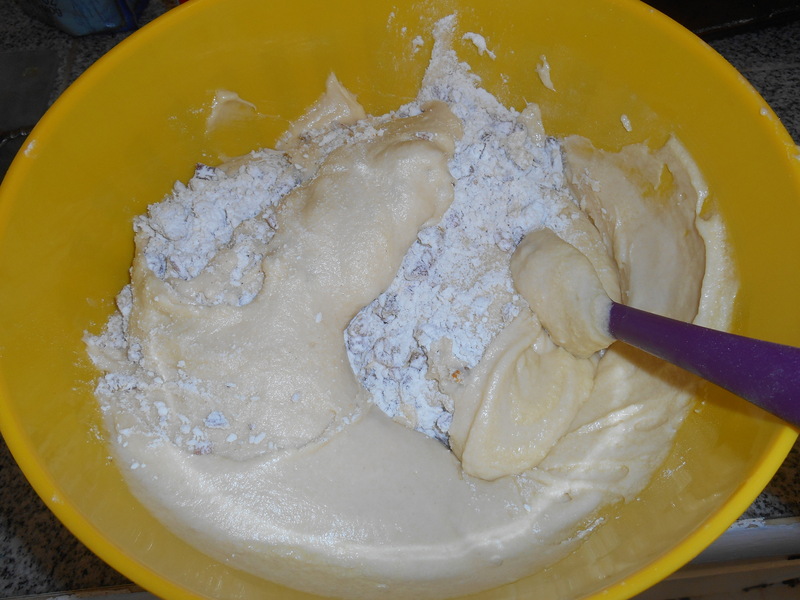 You now have three bowls of ingredients: the soaking fruit; the flour/nut/zest mixture; and the butter and egg batter. 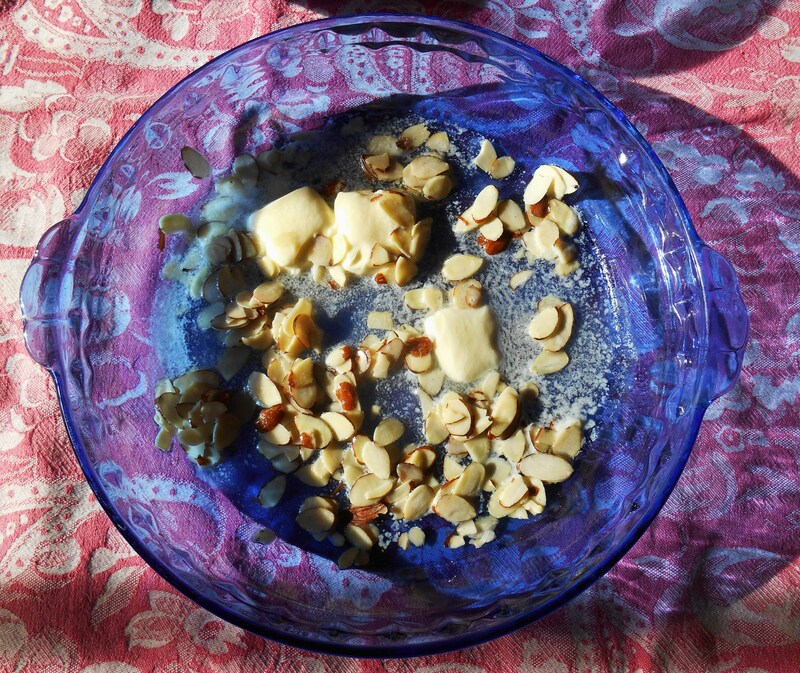 Make sure the bowl with the nuts is large enough to combine all ingredients. Add the batter to the large bowl of flour, spices and nuts, stirring with a large rubber spatula until the two are well combined. Pour in the soaking fruit and rum, and add a cup of canned or Maraschino cherries. Drain the juice before adding the cherries to keep the cake light in color. Adding the juice results in a pink cake…. Stir until the batter is smooth and no dry flour remains. Make sure your mixing strokes bring up all of the remaining flour and fruit from the bottom and sides of the bowl. Use a large ladle or dry measuring cup to scoop the batter evenly into your pans. Fill each pan about 2/3 full, as this cake will rise. Scrape down the sides of the pan and distribute the batter evenly. The batter should be very thick and heavy. Put all batter filled pans into the oven at the same time, on a rack positioned in the middle of the oven. Once the cakes are in the oven, don’t open the door for the next 75 minutes. This is important for the rise and texture of the cake. After the first 75 minutes are up, very small pans may be done. A tube or bundt pan usually takes 90 minutes to bake, and may need longer depending on how much fruit you have used. Check finished cakes for doneness before removing them from the oven to a cooling rack. Loosen the sides of the cake from the pan with a knife, and gently turn each cake out onto the rack. You may glaze the cake with melted jelly when they are partially cooled. I’ve used blackberry jelly, though apricot would be just as good. Just melt about 1/4 cup of jelly in the microwave and brush it on to coat the entire cake. 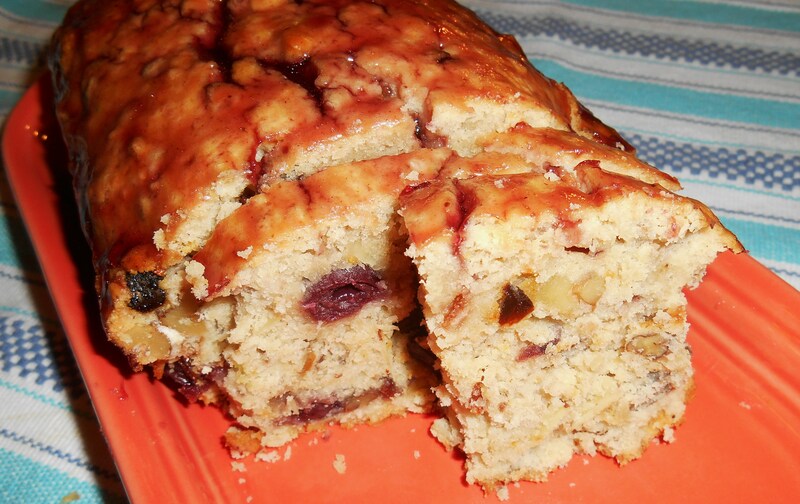 Garnish with nuts and more cherries if you like, or sift powdered sugar over the glaze. You could also ice the cake with butter-cream frosting or coat it in chocolate ganache. Fruitcake should be wrapped tightly and kept in a cool room. Mine often stays in the garage, where it will keep for a few weeks. 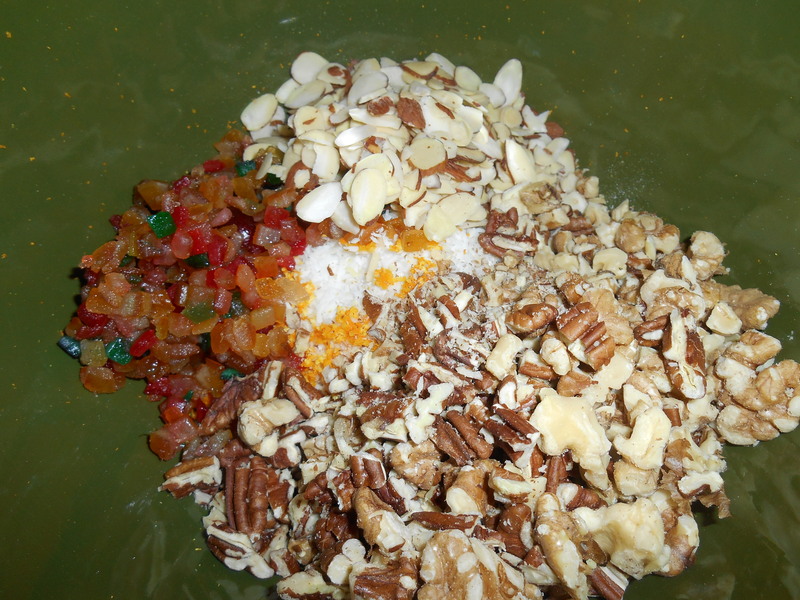 Many people like to age their fruitcakes for several days to let the flavors develop before cutting them. They are also delicious straight from the oven. Since this recipe makes a lot of cake, you can sample it straight away while also putting cake aside for later. You will never really appreciate how absolutely satisfying and delicious this cake can be until you have a slice (or two) for yourself. Baking is good for the soul, if not for the waistline. If you try the recipe, just know that you will perfume your home with deliciousness for at least the next day, and you’ll have the perfect dessert on hand for your special gatherings. Biscotti, Gone, But Fondly Remembered! Our friend, who is an amazing cook, made these beautiful cranberry orange biscotti for our coffee group yesterday. They are delicious. But even better, they are absolutely gluten free and vegan. There is no added fat in the recipe, beyond what occurs naturally in the nuts. Even though I’m the sort of cook who keeps a bag of Vital Wheat Gluten in the fridge at all times, more and more of my friends and extended family maintain gluten-free diets. It is always a challenge to stick to a restrictive diet, although recovering one’s health and well-being serves as a powerful motivator! And it is especially challenging at the holidays. So many of our warm memories and good times with loved ones involve our favorite seasonal foods. It is hard to enjoy family gatherings when our favorite foods are on the table, and we can’t enjoy them. It was tough for me when I shifted to a fully vegetarian diet in the 80’s. I suddenly felt very out of place at social events from cook-outs to cocktail parties. Hostesses were nervous in inviting me to dinner. Some still are, although there are far more of us vegetarians and vegans these days. There are many more options everywhere you go to eat well and avoid meat. It is a much tougher thing for those who require a gluten-free diet. Traditional family holiday meals are full of gluten, from appetizers to desserts. Gluten is a protein found in all wheat products. Anything which contains flour, or even comes into contact with wheat, becomes “contaminated” with gluten. That covers an awful lot of the holiday table, doesn’t it? That is why I was so excited to enjoy these wonderful biscotti yesterday. They are everything I love in biscotti: crunchy, delicious, and totally satisfying. They hold up when dunked in a cup of coffee, and then melt in your mouth at the next bite. And they are also very healthy to eat; as cookies go…. When I asked for the recipe, my friend sent a link to the recipe on the “elana’s pantry” food blog. Please follow the link to the recipe if you are interested. 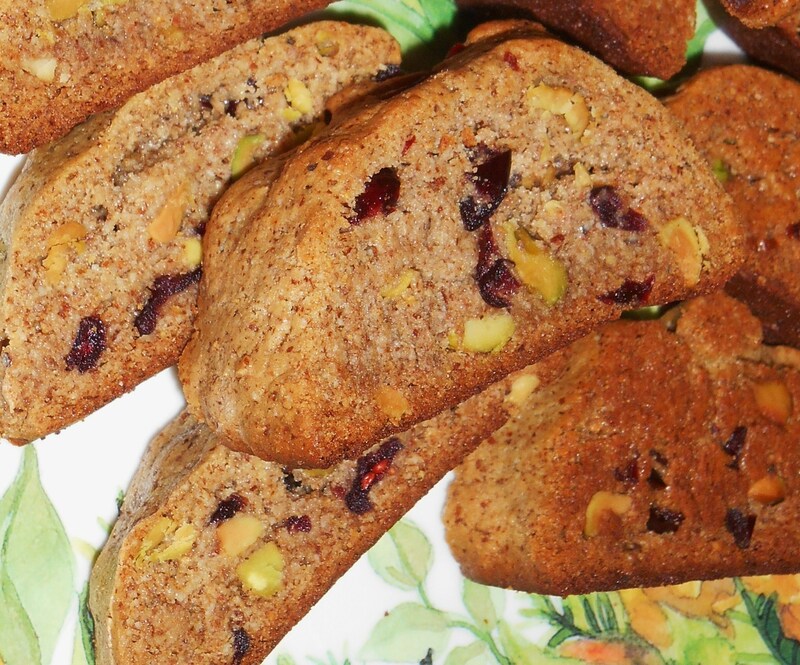 These wonderful biscotti are gone now, but certainly not forgotten. I plan to make a batch for Christmas, as a gift to those in my own family who eat a gluten free diet. Whether you follow a restrictive diet or not, this recipe is well worth the effort to try it. 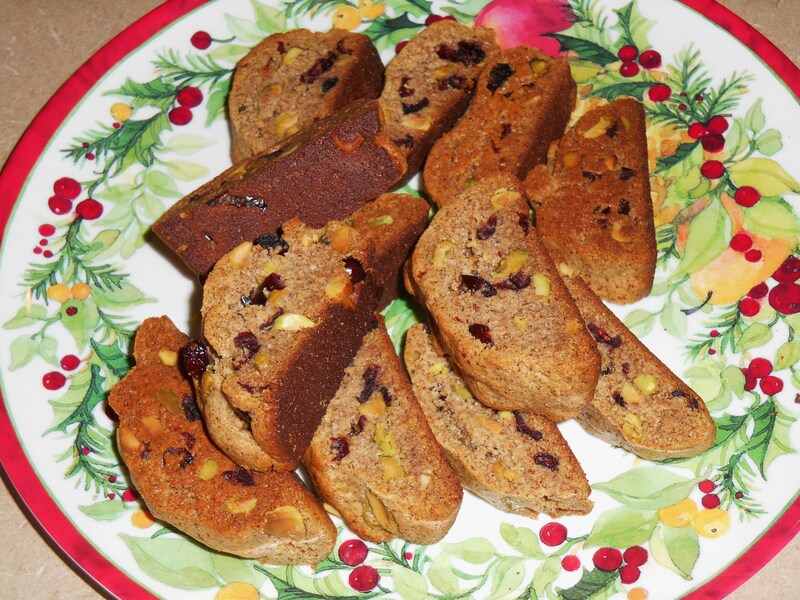 It is actually an easier preparation than traditional biscotti, with fewer ingredients. I would make only one change to this delicious recipe…. and it involves drizzling melted dark chocolate over the finished biscotti as they cool…. We watched an unusually interesting bread preparation on Cook’s Country last night on PBS. Unusual enough that I searched out the recipe online later in the evening, and tried a batch of my own first thing this morning. Do you like English muffins? We do. We love the open airy texture which gets crunchy when toasted, and then holds little pools of butter as you bite into the muffin. I love them with most any jam from orange marmalade to apple butter. My partner is a purist, and wants them just as they are, covered in melted butter. They are so good and comforting with a mug of coffee in the morning. But I don’t like buying factory made bread. And I really don’t like pitching all of that packaging for a purchase of only 6 muffins! And since this recipe for English Muffin Loaf is quick and simple to prepare, easier than mixing up a cake, really, I decided to try it out. Now, if you’re a baker, you know all about the difference between making quick breads, like corn muffins, and yeasted loaf breads. This recipe from Cook’s Country is a hybrid, which is what makes it so interesting. You mix the batter as you would a quick bread. 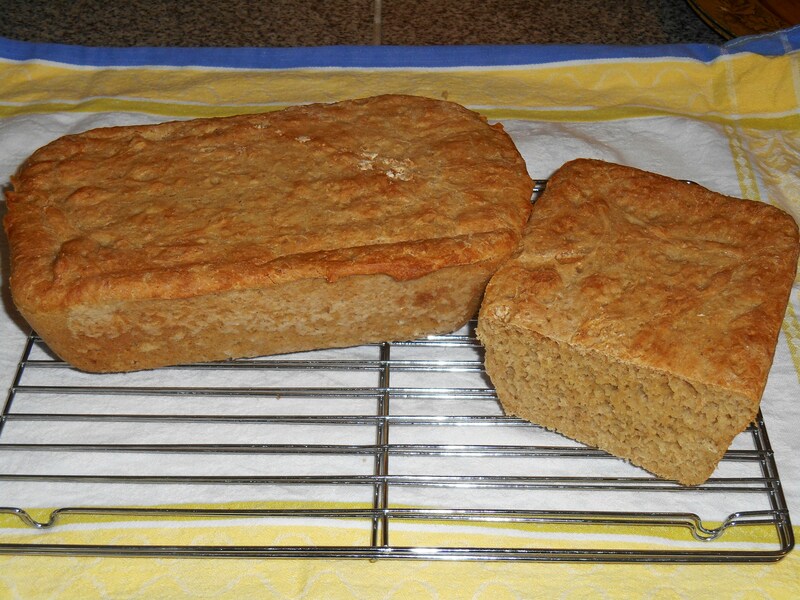 Both yeast and baking soda go into the batter to give this bread its texture. There is absolutely no kneading to this preparation. 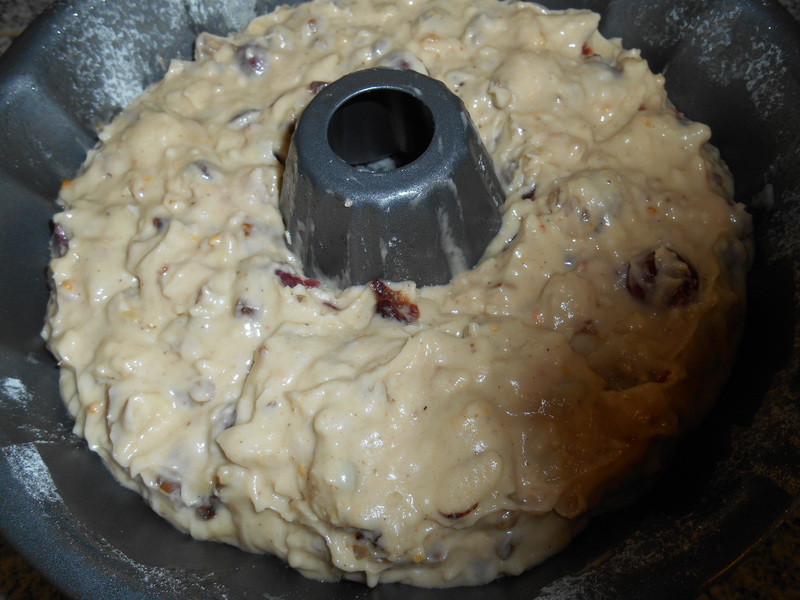 Then you give the batter 30 minutes to proof (rise) before pouring it into loaf pans. Yes, pouring. This is a very moist, loose batter. The bread gets another 30 minutes to rise before you bake it for an additional 30 minutes. Once the loaves are cooled, you slice the bread and toast each slice before slathering on the butter and jam and enjoying the decadent luxury of your own home made better than anything store bought English muffin toast. 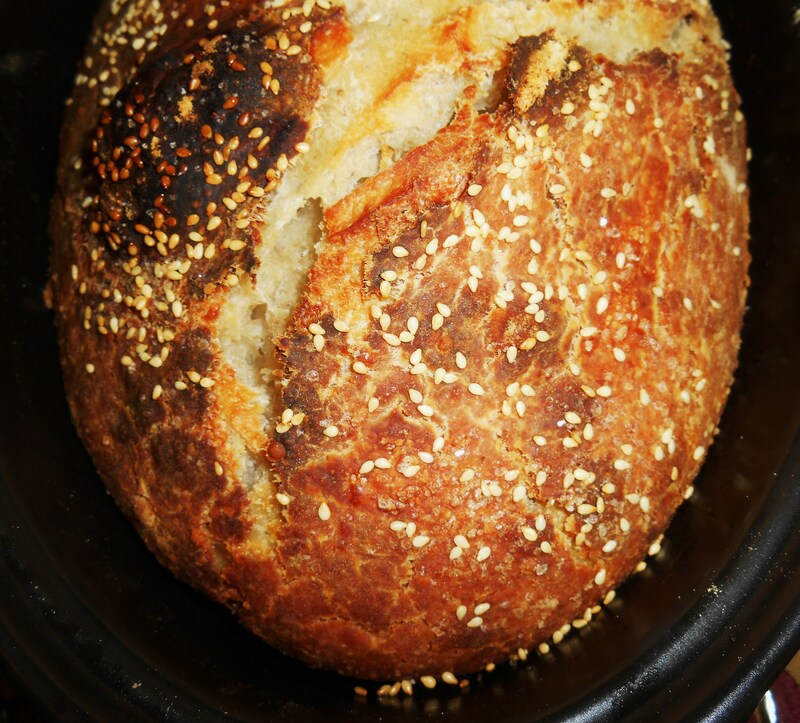 You can go from empty bowl to finished loaves in under two hours. Make these the night before, and you can have your morning English muffin toast as quickly as you can brew your coffee. If you watch Cook’s Country, then you know that it is essentially a test kitchen of very dedicated, precise chefs who demonstrate some pretty unusual recipes for junky amateur cooks like me. And so of course you know I’m going to give you the recipe exactly as they presented it, right?? Wrong! I’m going to give you my “tweaked and improved” version. A few seconds with your favorite search engine will give you their original if you want to compare. You need only 6 pieces of equipment in addition to your oven. And this preparation goes so fast I suggest you assemble it all before you start mixing. You’ll need a large mixing bowl, measuring spoons, a large measuring cup, a spatula, and either 2 loaf pans or one tube or Bundt pan. You’ll also need plastic cling wrap and vegetable oil cooking spray. Mix these thoroughly with a whisk or spatula so no “pockets” remain of any of the ingredients. You may substitute 5 cups of BREAD flour and leave out the white whole wheat flour and Vital Wheat Gluten if you would prefer. You can also dress this recipe up with a handful of dried cranberries, golden raisins, some grated citrus peel, a teaspoon of cinnamon, or perhaps some finely chopped nuts, if you’d like. Mix together 3/4 c. of sour cream and 2 cups of very warm water in the large measuring cup. Stir together until all of the sour cream is dissolved in the water. Cook’s Country specifies the milk should be 200F, which is right on the edge of being so hot it kills the yeast. I microwaved the sour cream and water mixture for about 30 seconds until it felt warm to my touch, but not hot. The temperature of the liquid is important mostly to speed up the rising of the batter. Stop and turn your oven to “warm.” We are going to proof the batter in the oven. Leave the oven on for no more than 2 minutes so it doesn’t get too hot. By now your oven should have been turned OFF, but it is warm. Place the covered mixing bowl in the oven (I put a hot mat under the bowl so too much heat didn’t transfer from my cooking stone to the dough) and just close the door. Let the dough proof for 30 minutes. Meanwhile, prepare either 2 loaf pans or a tube pan with cooking spray. Be generous. The only problem I experienced with this recipe was the bread sticking to the pans. Next time, I’ll remember to dust the pans with a little dry cornmeal before adding the batter. 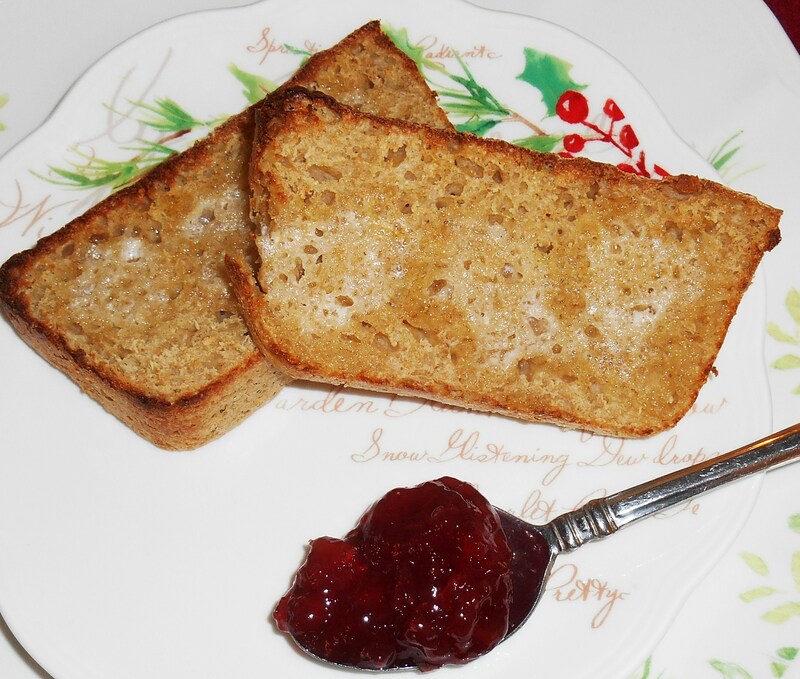 Have you ever heard of “Sally Lunn” bread? This is popular in rural Virginia, and we had it from time to time growing up. It is also a yeasted batter bread, always cooked in a tube pan, so it comes out looking like a cake. You slice it, toast it, and enjoy it. 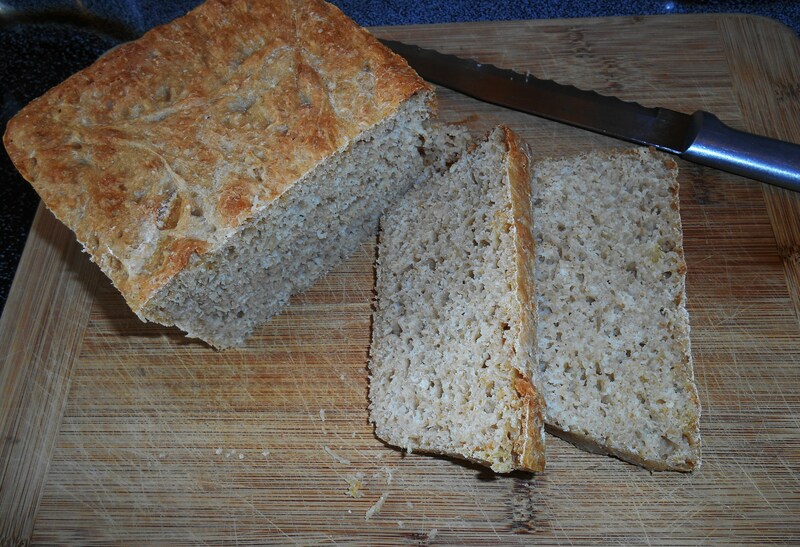 It is a little bit like this recipe, but has a much finer texture… more like a heavier, richer, regular bread. I believe this English Muffin Loaf would work great cooked in a tube or Bundt pan, like Sally Lunn bread, and plan to bake my next batch this way. The batter will have risen a lot after 30 minutes. Remove the plastic wrap (scrape off any dough with a good rubber spatula) and pour the dough into your baking pans. Use the spatula to spread the dough so it fills all of the corners and is of a fairly even height across the pan. Scrape down the sides of the pans to neaten things up, and put the pans right back into the warm oven. Use the same piece of plastic cling wrap to cover the pans again for the second proof. After 30 minutes of proof time, open the oven and remove the cling wrap covering. This is a very important step! This is a good time to make sure you took your hot mat out of the oven, too! Allow the loaves to bake, at full temperature, for 30 minutes. You know they are done when they are golden brown and fragrant. This recipe calls for very lightly baked bread. You don’t want a heavy dark crust to form. You bake only until the bread is set and solid all the way through the loaf. Cool the loaves on wire racks. Let them set in the pan for 2-3 minutes, loosen the edges with a knife, and then turn the loaves out onto the racks to cool. Allow the loaves to cool at least 10 minutes before slicing them with a serrated bread knife. 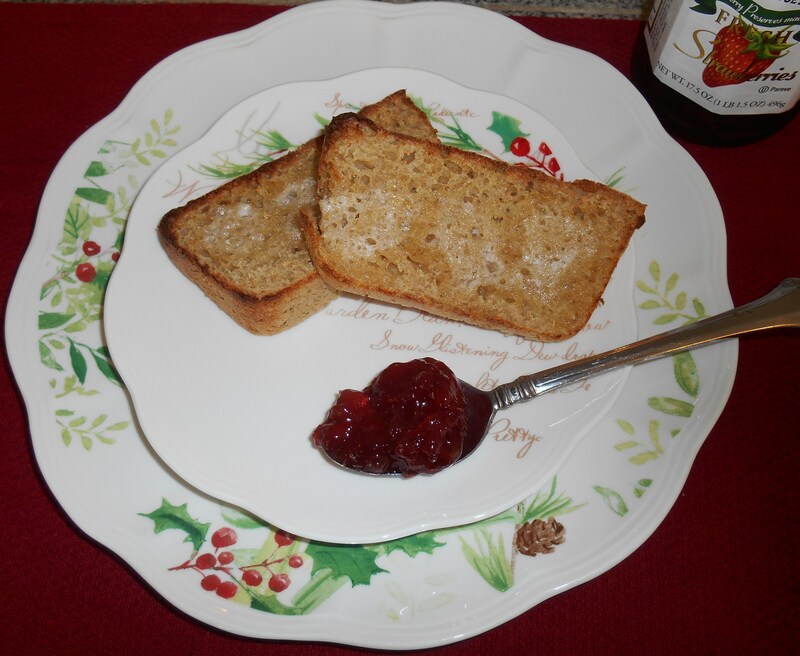 I make toast under the broiler, the way my grandmother did, so the butter melts as the bread toasts. You may prefer toast made in a toaster. Do whatever works for you. Just take time to enjoy this beautiful, fragrant toast with someone you love! You’ll find all of the important gardening dates for Zones 5-9 in this calendar: first and last frost dates, moons, equinoxes and solstices. You’ll also find gardening tips and reminders to help you stay on track throughout the year. In addition to all of the normal American holidays, you’ll also find some other interesting observances. Jewish, Muslim, and traditional Celtic holidays are noted, along with a few Saints’ feast days. I wanted to remember these special days for all of my circle of friends. Illustrated with more than 60 of my favorite photos from the past year, you’ll find landscapes, flowers, and lots of wild life as you turn the pages from one month to the next. 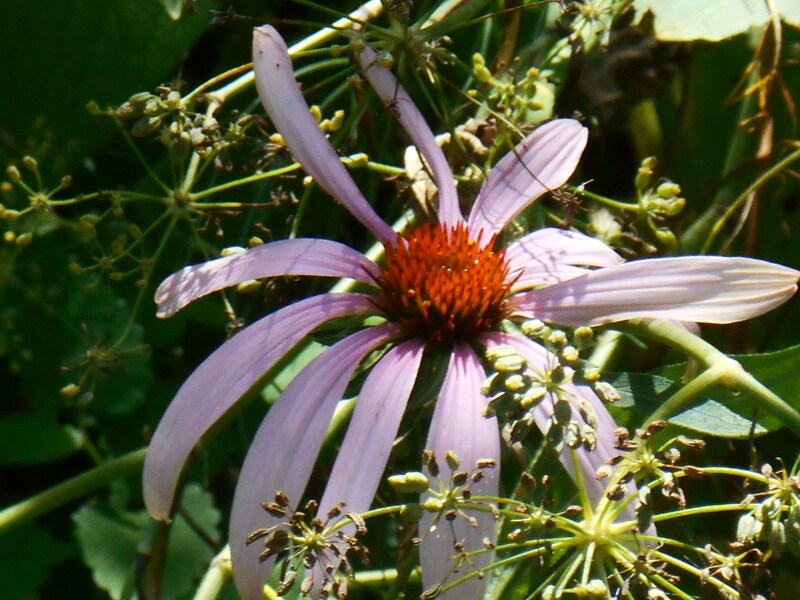 All of the photos were taken in our garden or in the greater Williamsburg area. This year’s theme is “Kindness.” Each month brings a new, thought provoking quotation. $15.00 includes the postage anywhere in the United States. Please contact me at woodlandgnome@zoho.com to order. It is the day before Thanksgiving and the house is warm and fragrant. I’ve been cooking since shortly after noon. The nor’easter which blew in late yesterday has almost pulled away. We had heavy rain and wind all night long. And our initial plan was to just stay inside all day; off the roads and out of the storm. Which was fine, until I remembered our promise to pick up the Christmas wreath we ordered weeks ago from the Patton Family at the Homestead Garden Center. It is a gift I had planned to take tomorrow to the host and hostess of our Thanksgiving Day dinner. Once we made up our mind to get out into the storm, and had on enough clothing, the rest was easy. Made even easier by the nearly empty roads around Williamsburg today. In truth, we saw at least three accidents and one speeding trooper along our way. But we still enjoyed a short visit at the garden center and came home with an exquisite, freshly made wreath. The Pattons have been preparing for wreath season since Halloween. They make fragrantly beautiful evergreen Christmas decorations of all shapes and sizes, and each is custom made to order. And then the cooking began in earnest. First up was a pot of vegetable soup. Then I began washing the cranberries and oranges for a beautiful chutney to contribute tomorrow. As soon as the pots were happily gurgling I mixed up a batch of cheddar cornbread for muffins. And last, but not least, I scrubbed the sweet potatoes and carrots and got them into the oven to bake to sweet perfection. They will end up sliced into a casserole with orange slices, butter, maple syrup and spices for tomorrow’s dinner. There is some lovely sweet potato bread dough in the refrigerator, and I’ll set that out to rise so it can go into the oven by sundown. Not that there is any sun to go down, mind you. We’ve had a heavy low sky all day. Thick clouds have blocked most of the sun and left us in grey twilight since morning. We know that were it only a few degrees cooler, we would be shoveling snow. Which makes Thanksgiving even more fun, if you ask me. This is the perfect weather for cooking. And it has me in the mood to string twinkle lights and break out the first of the Christmas decor. Every red bow and evergreen wreath is a welcome sight on this cold, wet day. And now I’m ready to curl up on the couch with the cat and a good book, looking forward to what I would argue is the coziest and most enjoyable holiday of the year. Wash and pick over a 12 oz. bag of cranberries and add to a heavy saucepan with a cup of sugar, 1/4 c. of water, the juice of an orange, and 3 tsp. of red wine vinegar. Sprinkle with 1 tsp. of cinnamon, 1/2 tsp. of ground cloves, and 1/2 tsp. of ground (or freshly grated) ginger. Turn the heat to medium low while you dice a medium apple, washed but with skin left on. Add the apple to the pot and stir. 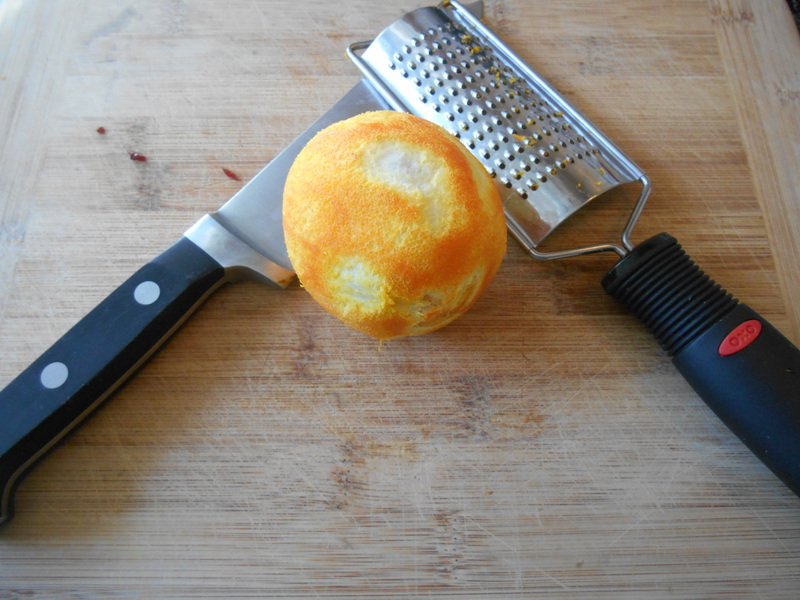 Remove both ends from a washed medium seedless orange. Slice the orange as thinly as you’re able, reserving the juice. Stack a few slices at a time, and cut them into tiny bits so that no piece of the orange peel is more than 1/2 inch wide. Add all of the orange, peel, pulp and juice to the cranberry mixture. Cook over low heat as the berries pop and the sauce reduces and thickens, stirring occasionally. I keep the lid on the pot as it cooks. Turn off the heat after about 45 minutes and let the cranberries stand for another hour or so, undisturbed. Stir, and turn the heat back on to medium low for another half hour. May your travels be safe, your meal taste delicious, and your loved ones come within hugging distance.